Back Again! Cats and New Recipe! The cats started out the weekend keeping us entertained on Friday night with their new box. 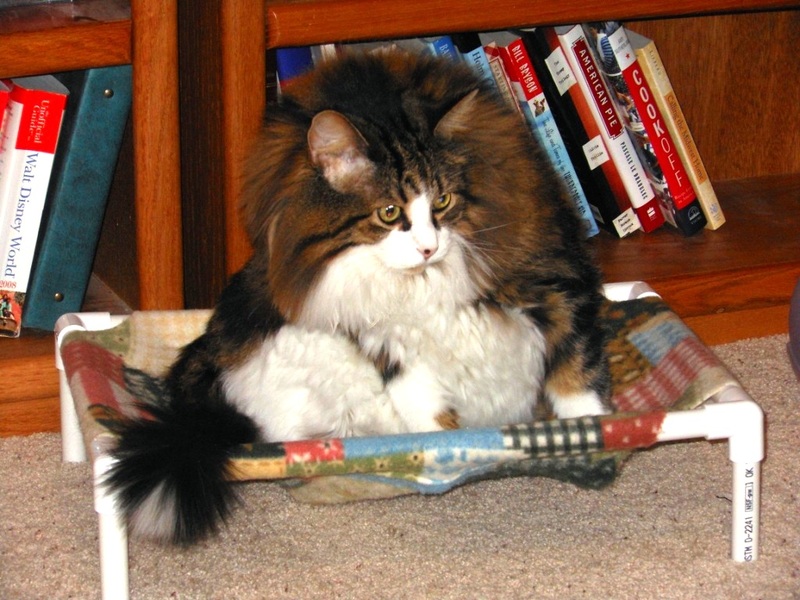 I had ordered some very small item on the internet and of course it came in a box that was quite large for the item, but just the right size for the cats. 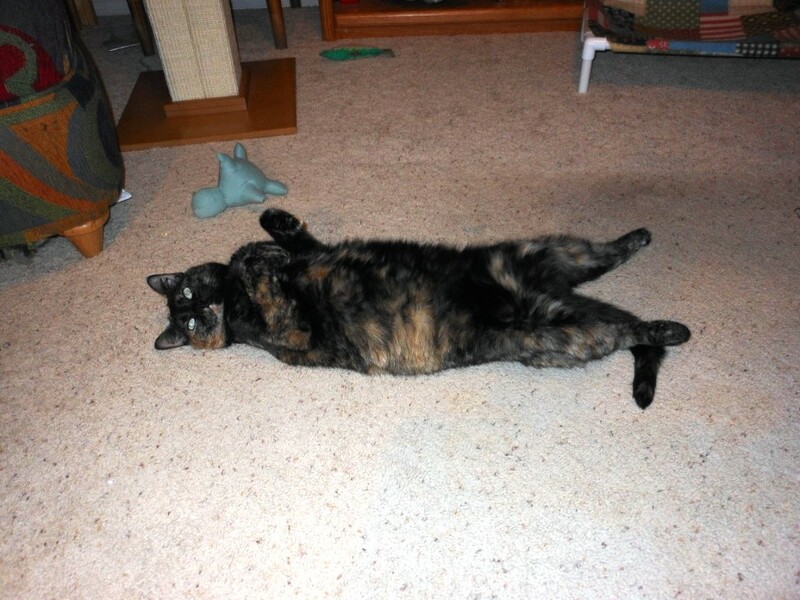 Well, the small-sized cat at least. MaryAnne plopped herself down into the box, even though Leo had been doing his best to claim it by rubbing his whiskers all over the flaps. A rousing game of poke-through-the flaps then ensued. And the Leo jumped INTO the box ON TOP of MaryAnne. Keep in mind this box was just barely big enough for MaryAnne, let alone her 20-pound brother on top of her. Needless to say, mayhem ensued. And neither one of them has been back in the box since. Too traumatic, apparently. It was a good weekend for trying out new recipes. 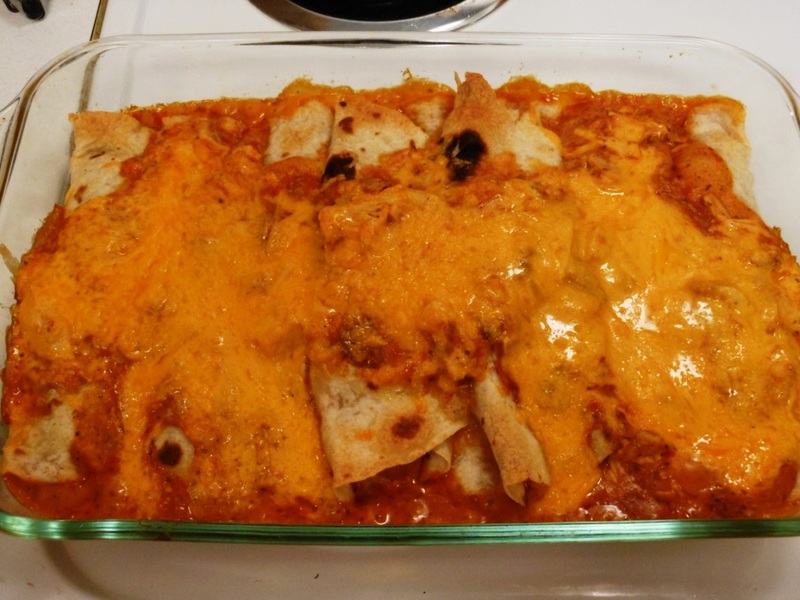 I just discovered a new food blog through Pinterest, Plain Chicken, and saw several things I wanted to try, including these Cheesy Chicken Enchiladas. These were good. I did have to take the stick blender to the sauce when I discovered I had purchased a chunky salsa, Ken is not wild about chunks of tomato. 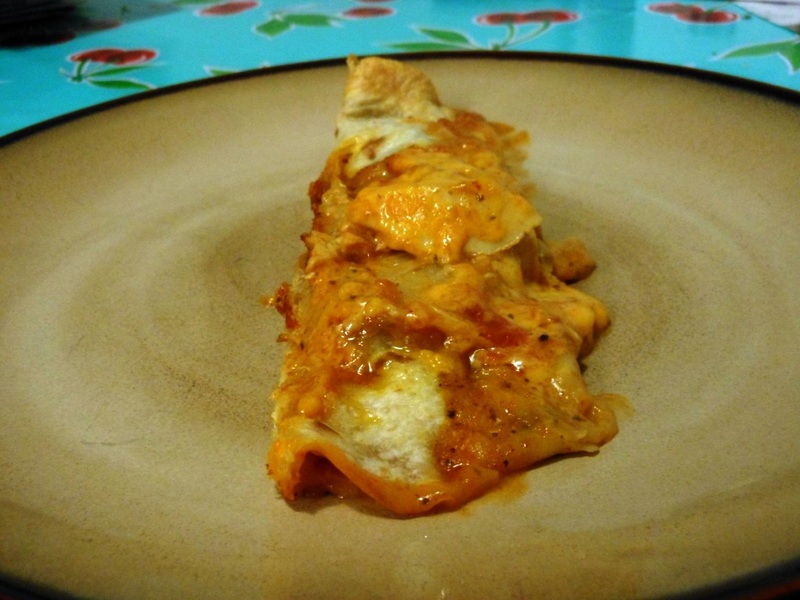 I personally would like more sauce – I would cover the enchiladas with mild enchilada sauce and then put the remainder of the chicken/sauce on top. Maybe I will try that next time. These are definitely on the “keep” list. I don’t have any pictures of the Box Invasion incident, but how about a few pictures of the little darlings being themselves? Ken fed the little darlings soft food for a treat last night, and one of them (LEO) barfed it off of the end of the bed where I then stepped in it this morning, so that is on the NO list now, at least for the big Leoski. MaryAnne seems to have a stomach of iron. Before I tried the new pasta at Panera Bread, I tried the new breakfast souffle. This souffle is part of the new fall menu, and so it does have information and nutritional data available online. 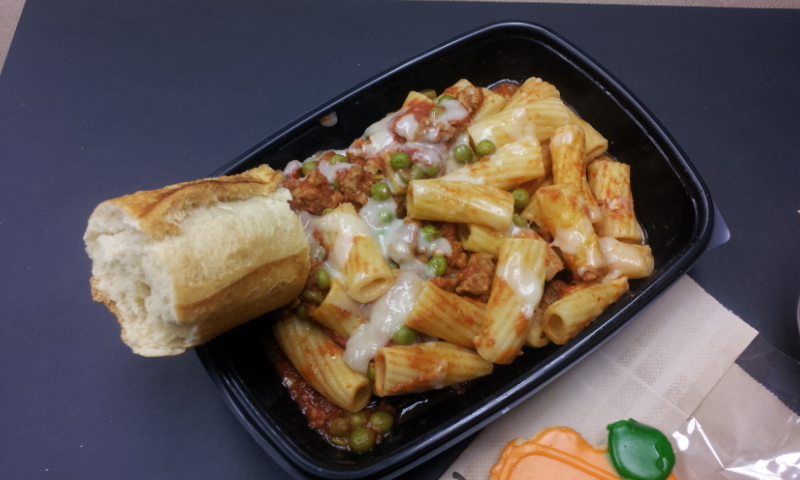 Panera’s description: Sausage & Gouda NEW! 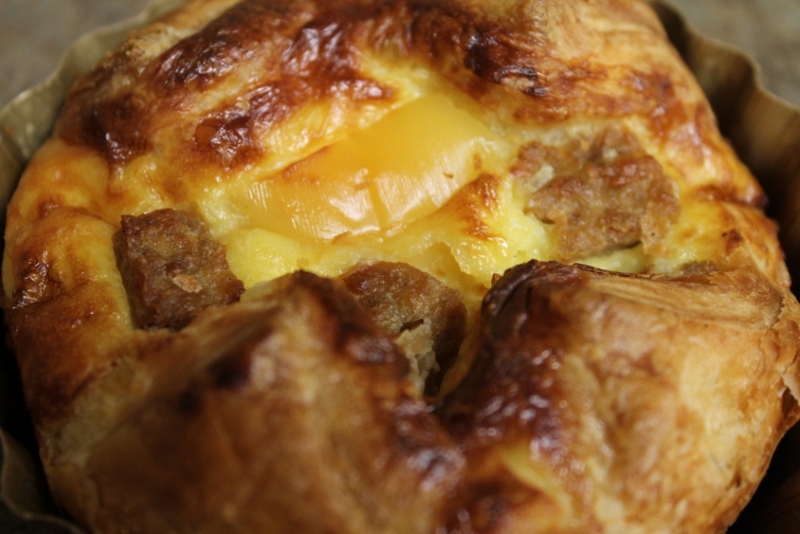 Savory egg mixture, sausage, and smoked Gouda, baked in our sweet croissant dough. Well, how can that not be good? And it is good, in terms of delicious. 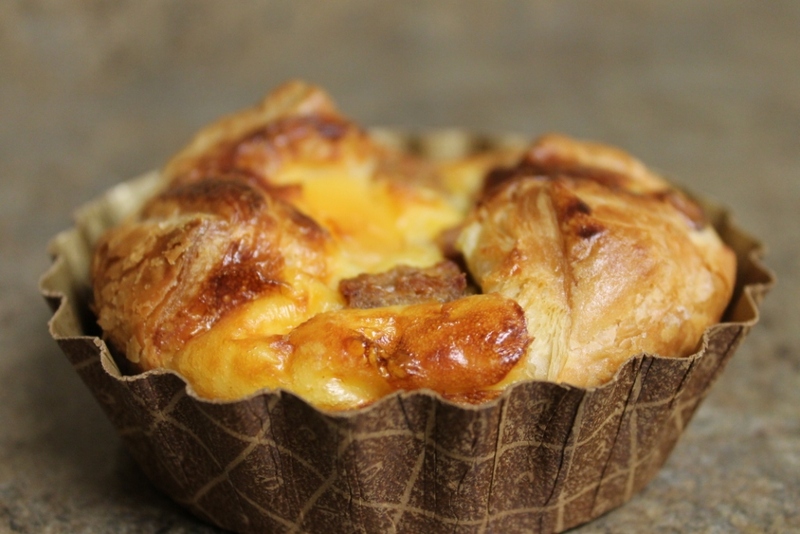 Nutritional information: Sausage & Gouda 1 souffle 560 calories, 36 grams of fat. Yowza. Not an everyday breakfast item if you are trying to lose weight. The gouda cheese is very rich. Looking at the nutritional information, it is unusual that the lowest calorie (480) baked souffle is the Four-Cheese Baked Egg Souffle. It seems like the spinach and artichoke one would be the best, but it is only the second-best. 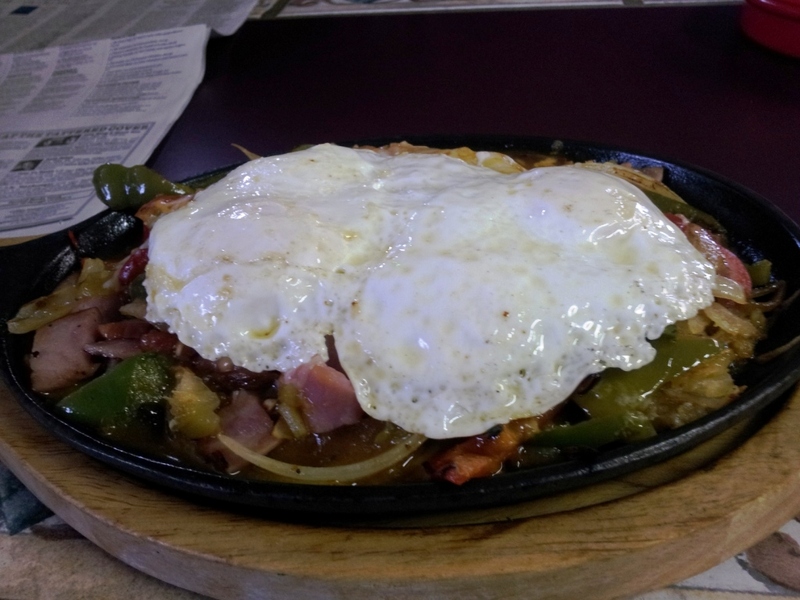 I had another breakfast that I was waiting to try – the Good Morning Arvada Skillet at Las Potrancas. 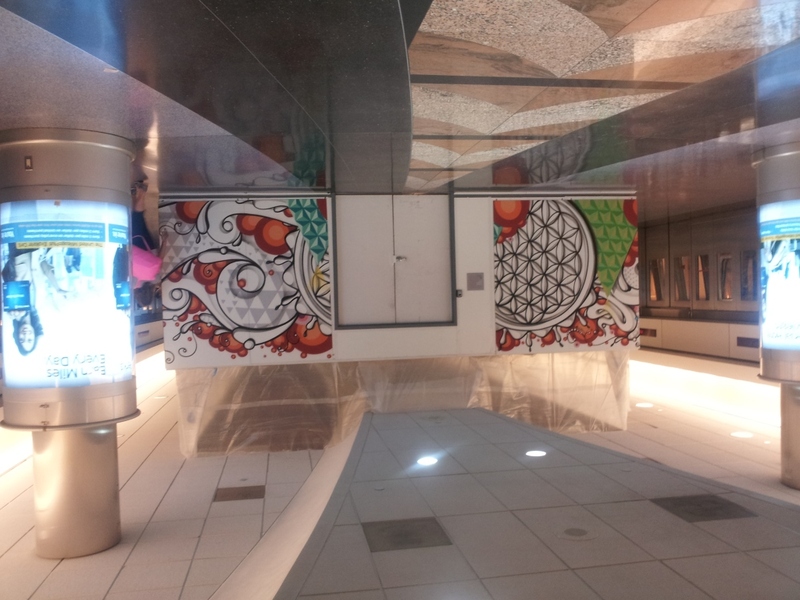 The first time I tried to go there, it was on a Sunday, and they were just barely open. It appeared that the appointed cook for the day had not come in. The staffer who was there was telling a customer it was going to be about a 40-minute wait for his multiple (quite a few – like 24 or 30) breakfast burritos he had ordered in advance. So I decided not to hang around that day. I finally got back on a weekday. The Good Morning Arvada Skillet is described as: “Two (2) egg omelet with onions, tomatoes, bell peppers. green chile and your choice of sausage, ham, bacon or chorizo.” But it is pictured on the menu having two eggs over easy on top, and that is what I wanted. Here is what mine looked like, sorry for the bad lighting. This was the greasiest thing I have been presented with in a long time. There was no way to finish. I was not sure how they got it so greasy, unless they fried those hash browns and veggies in a pool of lard. This was an excellent concept, not so much in the execution. I may have to try homemade. 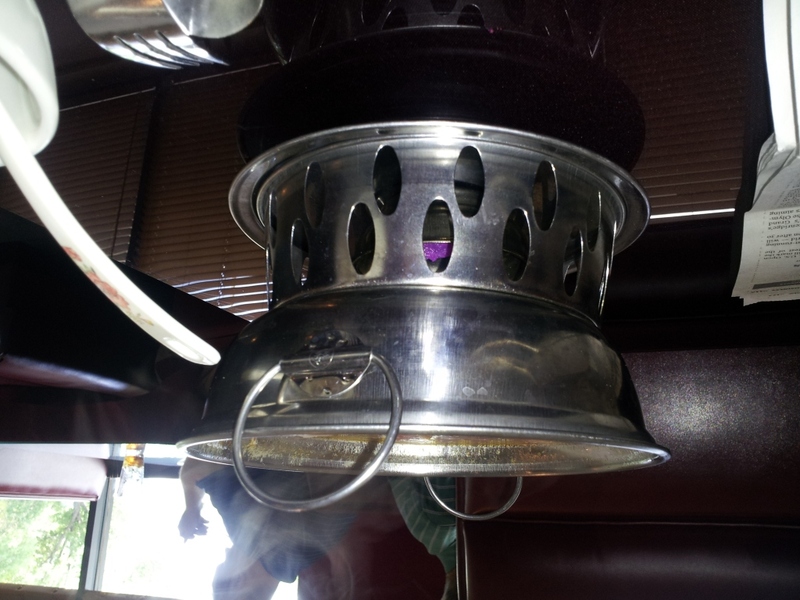 I had a better version at the Ralston Cafe in Arvada last week – sorry, forgot the pictures. 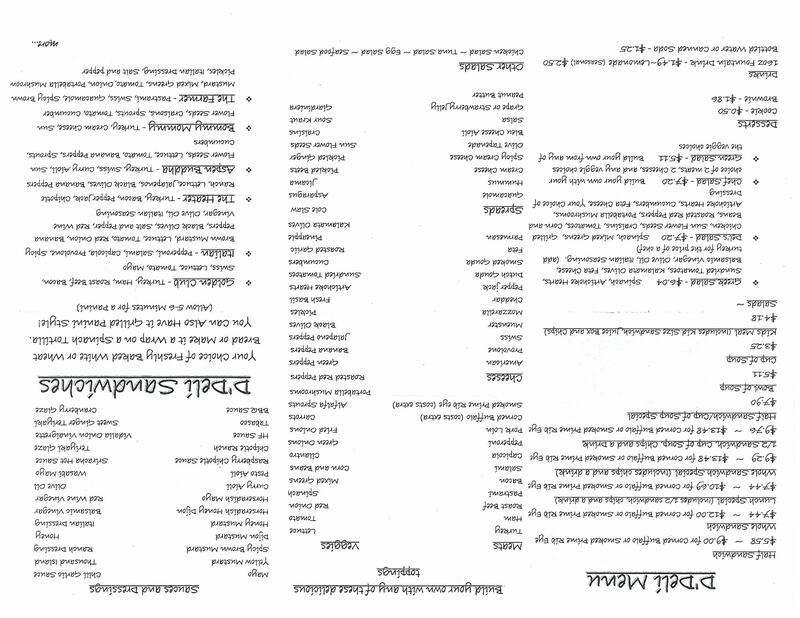 Here is their menu. Their version is the Huevos Garcia – sauteed onions and bell peppers topped with two eggs, smothered with green chili and cheddar cheese. This was much better. Still, I think a homemade version could be in the works. The problem is the green chile (or chili) – I have only really had one kind of green chile that I really, really like, and that is Santiago’s. So I would need to buy some of that, and keep from eating it long enough to put it on the hash browns, hmmm, maybe that is an idea. Needless to see, the spicy-averse husband will not be indulging in this breakfast dish. That is an octopus, if I am not mistaken, and of course that made my day. 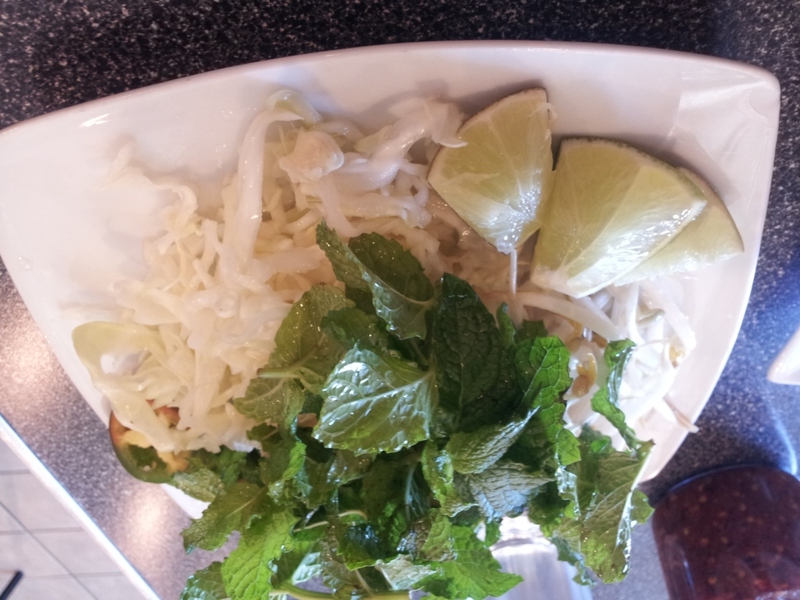 So I have numerous restaurant meals to report on, since I have been remiss in my blogging. 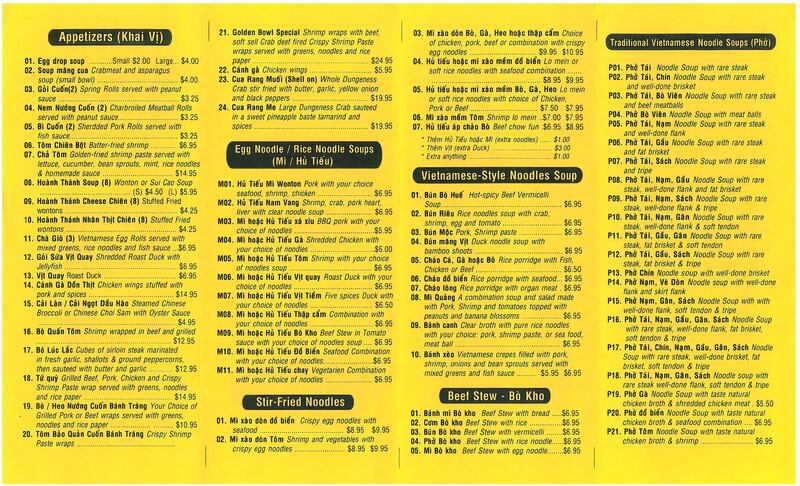 I returned to Golden Bowl Noodle House (see previous entry) and had one of their Combos – small bowl of beef noodle soup (steak pho), 2 egg rolls, iced tea or soft drink, for $8.95, which is a pretty good price as far as I am concerned. Here is there menu. EM, you and I need to go here together. SO MANY things on that menu I want to try. 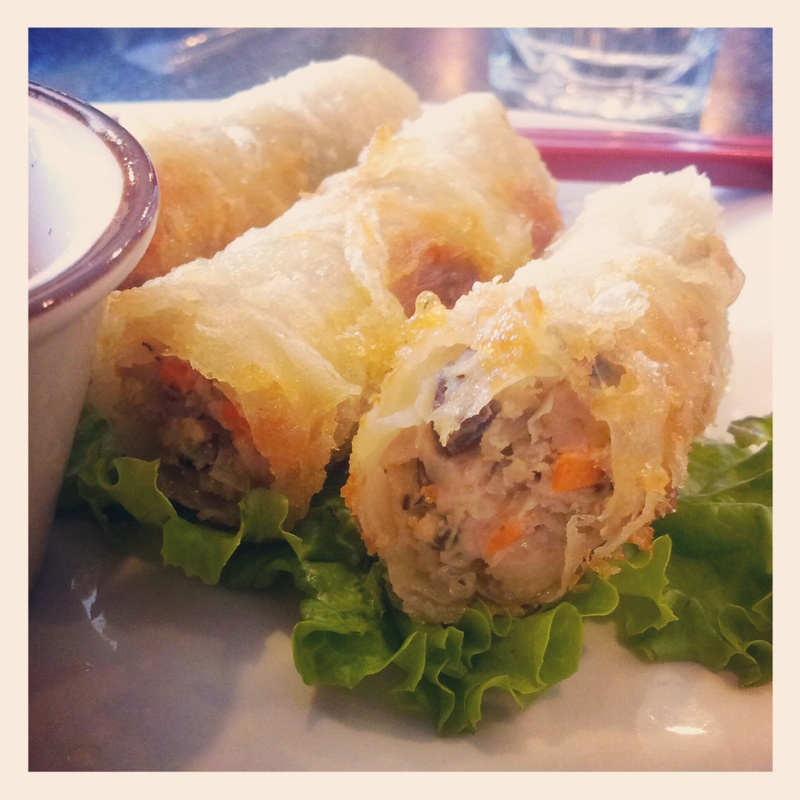 And I think that is the most reasonable price on spring rolls I have seen lately. 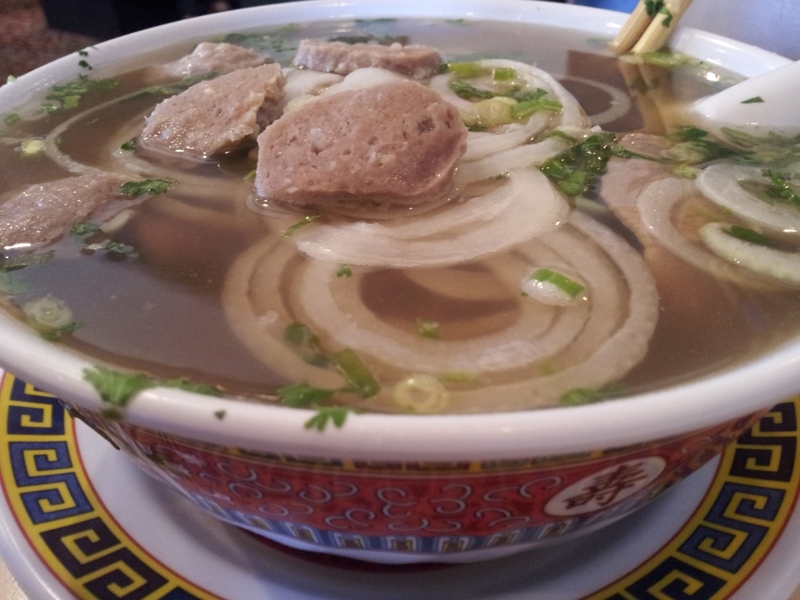 Here is the pho, it was excellent, my almost-favorite, second only to the place where they know my order by heart. 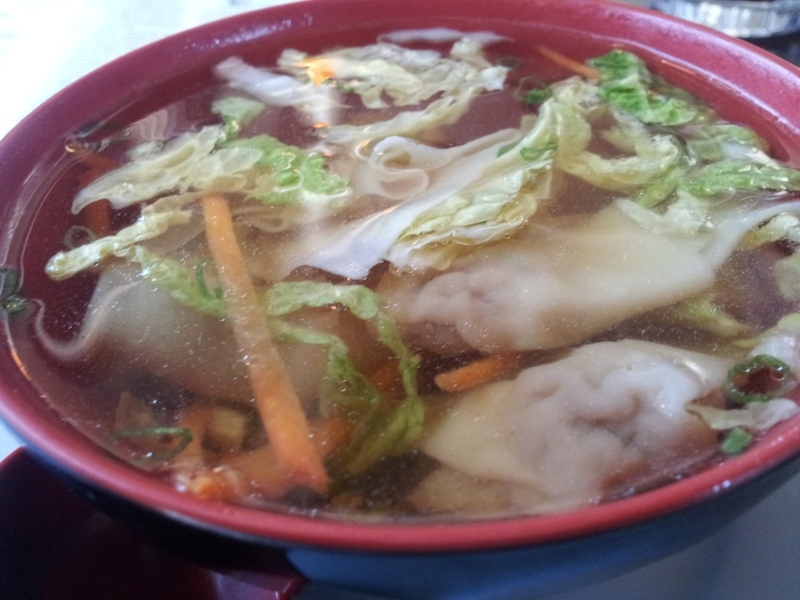 I ate at OOKA Sushi in Broomfield, but I forgot to take pictures of my rolls, I just took pictures of my wonton soup. It was excellent wonton soup. I think I had the veggie tempura as well. The soup, tempura and rolls were all good, just too much. My eyes are bigger than my stomach, as usual. The Banano is also excellent. More food pics tomorrow. Can’t do any more right now, making me hungry……. Writing this entry a week and a day later is not a good idea (and then it took me a few more days to get it posted….) Everything was starting to be blurry by this point anyway. Fair, fair, fair, sore feet, fair…. We all slept in for a bit, and S. had a Dr. appointment that was nearly forgotten, and after she got back from that, Wade had a conference call, so it was about 10:45 before we left the house, and maybe 11:30 by the time we made it to the fair. 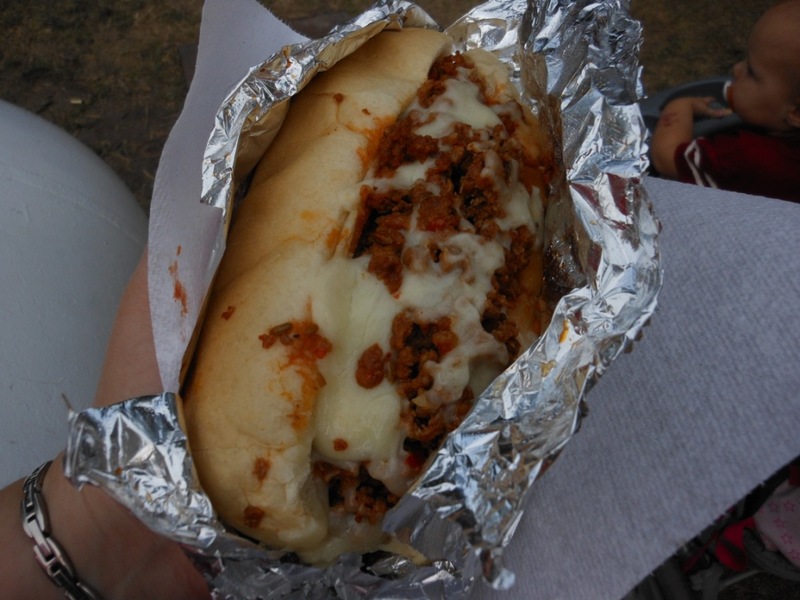 The kids commenced to riding on the rides, Wade grabbed some mini-cinnamon rolls again, and I headed for the Lamb Producers booth on the south side of the fairgrounds to get a lamb sandwich. 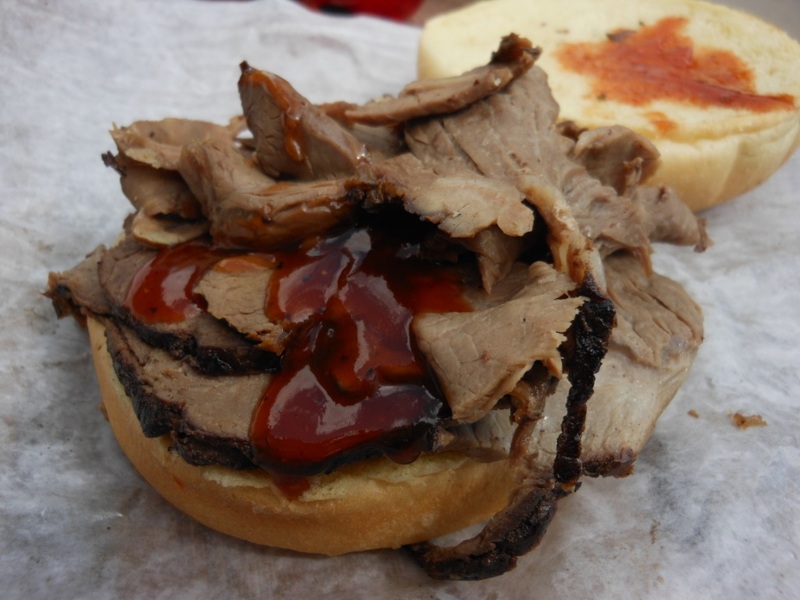 It was OK – could have used more barbecue sauce, but the sauce pump was being slow. Next time I will try the lamb walking taco or lamb kabob, this was just a bit dry. As I walked back across the fairgrounds, there was no line at one of the crazy fried foods booth. By now I realized my limitations on how much fried stuff I could eat in one day. So I tried to pick something unique that I hadn’t had before and wouldn’t ordinarily encounter. So I chose the deep-fried pineapple. 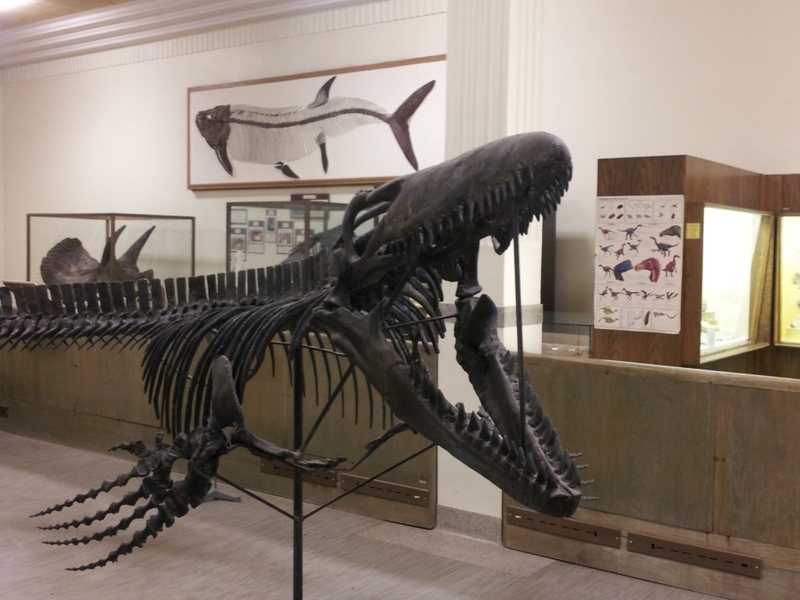 Wade declined to have a bite. This was really pretty tasty. We watched the kids go on rides for a while, and went to get some lunch before their friend got there. 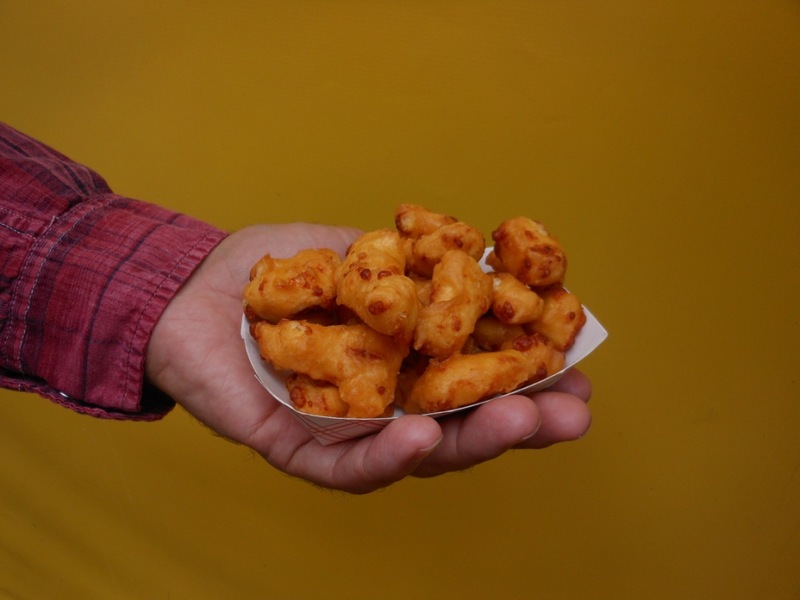 We started with cheese curds, which everyone shared. I think we went back up the hill to get D. macaroni and cheese again, and so I could go through the Cultural Arts building and get the prints I wanted. 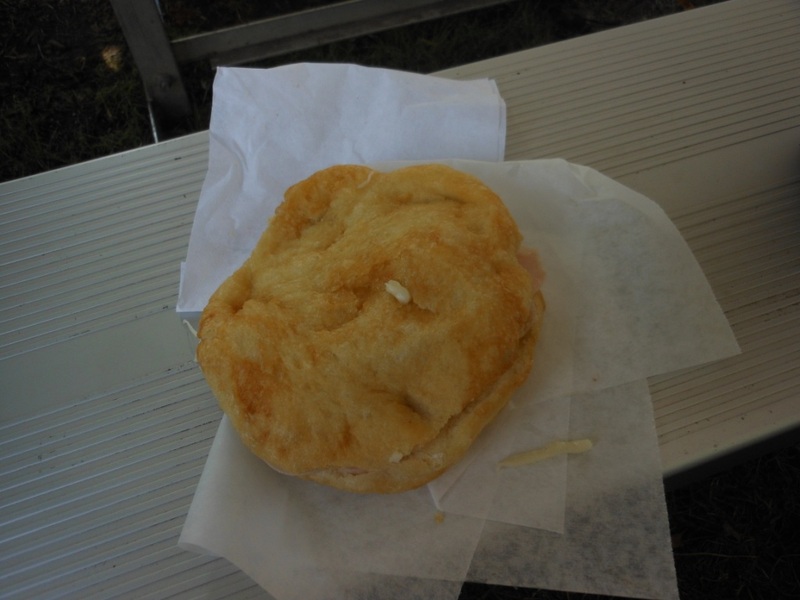 At some point when the kids were riding rides, I got a sandwich at Crescenti – this is a fried bread sandwich with mozzarella cheese, ham, cappicola, hard salami. 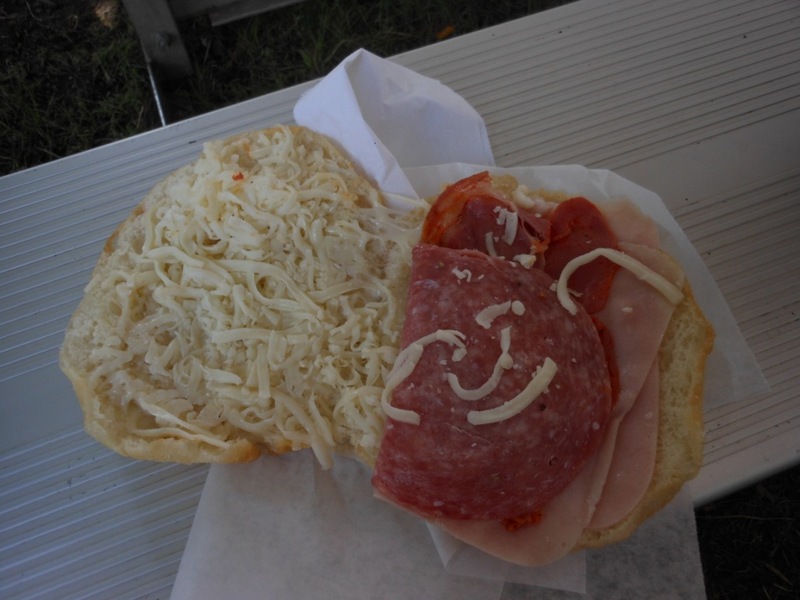 I think they then warm it up a bit to get the cheese melty. This was very good too, I would have this again. The fried bread is excellent. We knew we had to wrap it up pretty early because I had to be dropped at the airport, and they had to get home for the kids’ school open houses that night. We did all end up in the Varied Industries building together one time, because the kids wanted to get temporary tattoos, and Wade wanted to get the famous “Bucket of Chocolate Chip Cookies.” The cookies were not bad – I didn’t get any cold milk with them, and that really would have been the best way to have time. 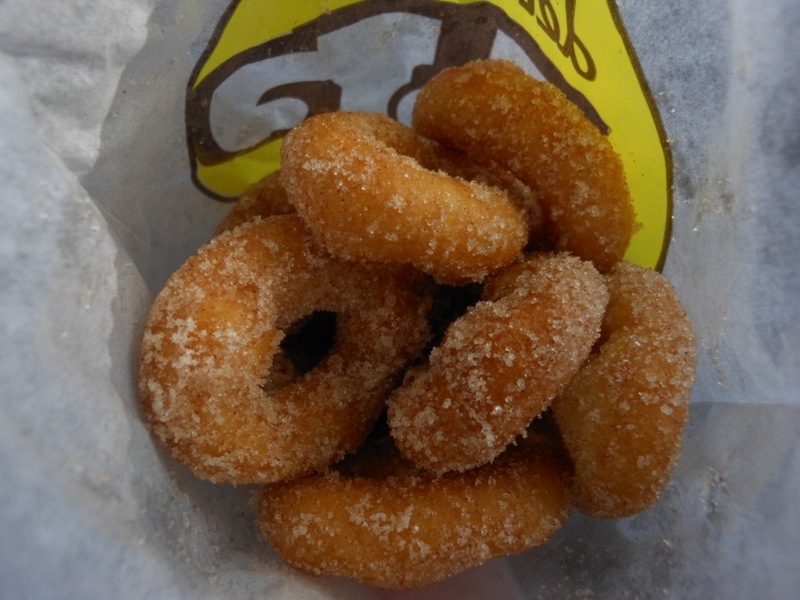 They are best warm, right at the fair. They lose some of their appeal at home at night. All in all, it was a great trip. I think the ideal way to go would be to have a break day in between each of the days at the fair, because, man, your feet start to hurt. Things I wanted to do but didn’t get to: Iowa wine tent, craft beer tent, sit and watch more of the foods judging, watch the piano, accordion and harmonica contest, watch more of the Bill Riley Talent contest (looking at the results, one of the pairs we saw tap dance from the Sprouts division was selected one of the top three Sprouts acts). I didn’t eat nearly everything I hoped to eat, which is probably just for the best. I would love to get there to get a seat to watch the sheep shearing, and would love to watch some of the more crazy contests like husband calling and rubber chicken tossing. There were many more shows and activities on the free stages, and a hymn sing, and demonstrations, that I would love to see. 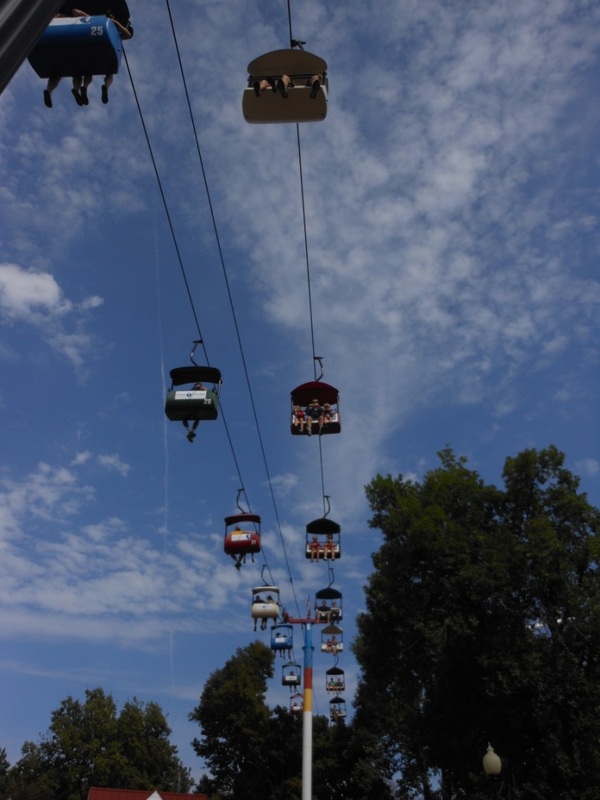 There is a “Old Mill Stream” ride that I didn’t go on, as well as a 2nd aerial tramway. So much to do, so little time. So many opportunities to people-watch. I forgot to mention that S. Watched the crowning of the Iowa State Fair Queen instead of going to the concert on Saturday night, I wouldn’t have minded watching that either. She got her picture taken with both the 2011 and 2012 queens. Wade now has a new favorite food, the hot beef sundae, over-ruling his previous default lunch of a pork tenderloin. I think that the hot beef sundae would be my top food of the week, too. 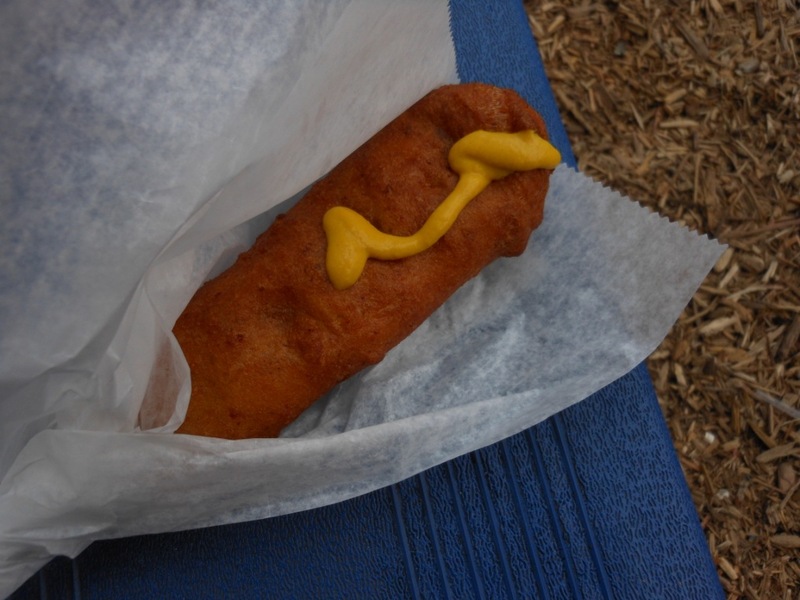 Top five foods: hot beef sundae, Crescenti sandwich, deep fried pickle dawg, hot bologna on a stick, and dutch letter. Sunday morning it appeared that it would only be my brother and I for awhile, everyone else was still asleep. My sister-in-law is generally not that enthusiastic about the fair, but she was willing to come for another day since I was there, and the two older girls were going to be working at Old McDonald’s farm as volunteers to help the participants, so she would bring the kids later and we would get to spend some time with D. while the girls were working. We decided to head for the Varied Industries building (commercial exhibits), so we could go through it without the kids and their primary interest in getting temporary tattoos along. 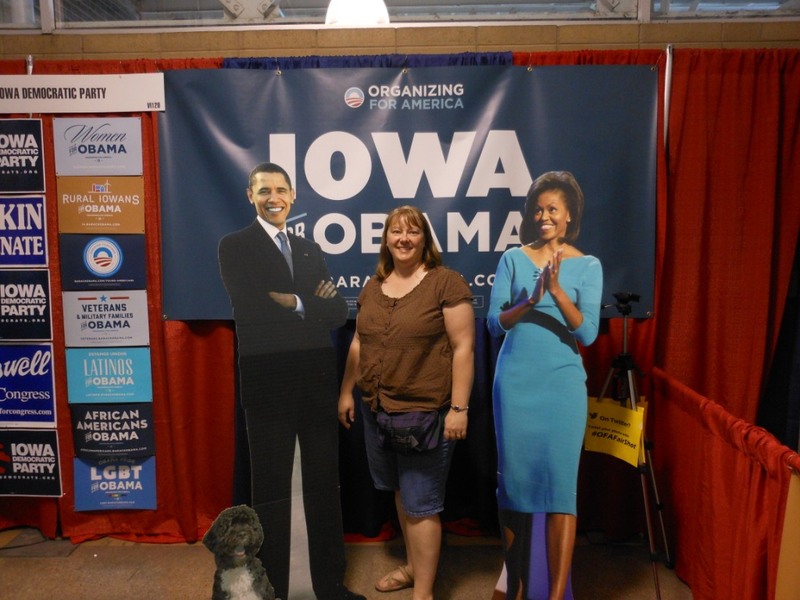 Of course, I had Wade take my picture with the cutouts of the Obamas at the Democrat booth. He declined his opportunity. Speaking of ring bologna, there was a booth of goods from the Amish, including ring bologna, which I couldn’t purchase to take home because it was refrigerated. But they also had a bunch of dry soup mixes, which I always enjoy trying, as well a cookies, candy, breads, handmade items, etc. They even had small individual serving soup mixes, handy for lunch or breakfast. That was probably my favorite booth. Then I stopped by the Tupperware booth, and found they had two different new flip-top soup mugs, which would be ideal for making the soup mixes I found at the Amish booth. I started making a list of things I was going to come back and buy, and started wondering how I was going to fit them in my carryon suitcase. I also discovered that the quilting, crochet, knitting, etc., was upstairs in this building – I popped up there to see if it was something to look at quickly, but there were a lot of beautiful things to look at, so I decided to come back later when I was on my own. There were also several rooms downstairs featuring Iowa foods (with samples), I had some excellent hot salsa. We got through the commercial building and headed up to the Double Bacon Corn dog booth, which was across the fairgrounds and up a hill, so at least you got some exercise going up there to get your corn dog. Wade and I each had one – they weren’t too bad for the first two bites, but then they really got to be a bit much, a little greasy at the end. And once again, I was feeling like I had quite enough fried food for a while. Worth having once but I don’t think I need to have one again. We were close to the cultural building where they had the photography, sculpture, woodworking, etc., so we went in there and looked at the photos and paintings for a while. They also had artists with items for sale, and I found some prints I liked and put on my list to come back and get later. By this time, we had heard from Laurie that she and the kids were there, so they came up the hill to find us. T. and D. needed some breakfast – T. had eggs, potatoes, and Texas toast, (and the potatoes had sausage and green peppers in them so Laurie and I ate most of them) and D. had macaroni and cheese – which was also good. 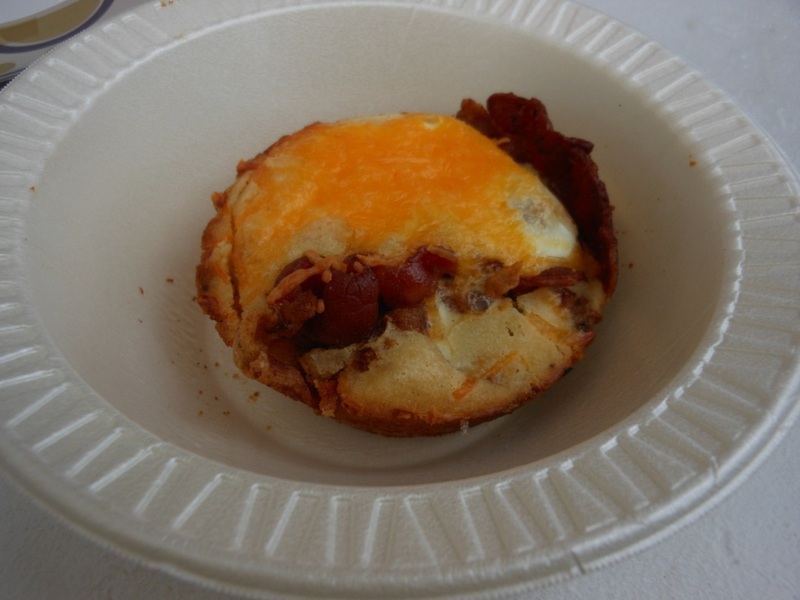 I decided to try the bacon-wrapped eggs, which was kind of like a muffin with a whole egg in the middle of it and bacon on the outside – it was not bad. Oh, and cheese on top. And possibly there were potatoes in there. Breakfast in a muffin! 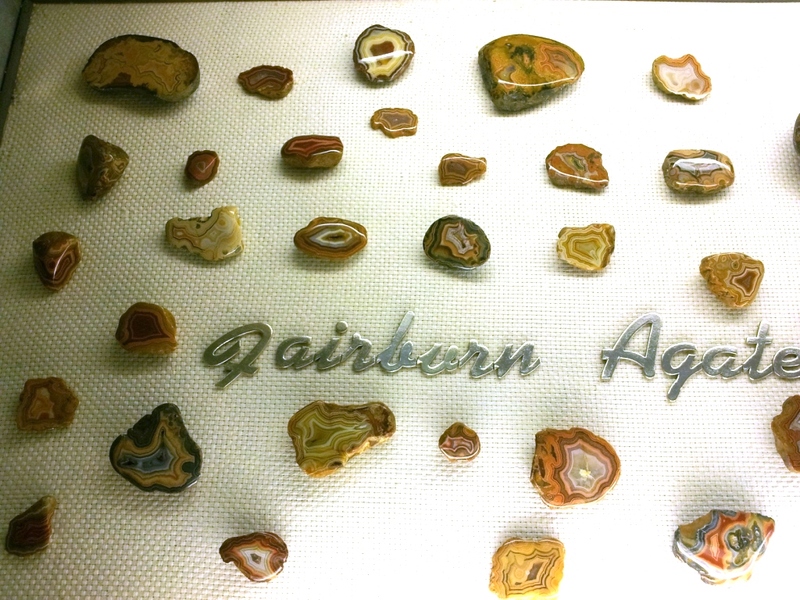 Another new thing for the fair this year. Once the kids were fed, we hopped on the State Fair trolley to ride down the hill, and Laurie headed off for Old McDonald’s farm with S. and T., and Wade and I stayed on the trolley with D. We walked through more commercial exhibits under the grandstand, and then Wade and D. headed for the Department of Natural Resources building to look at the big fish, and I headed for the Varied Industries building to look at the quilting, crocheting, etc. Lots of very nice things. The area that seems to be least popular is hand embroidery. Some really outstanding quilts and beautiful lace knitting. Next time, I should start in this building while my feet are still fresh. Before I headed over there, I stopped and got a Dutch Letter, which seems to be an Iowa specialty. 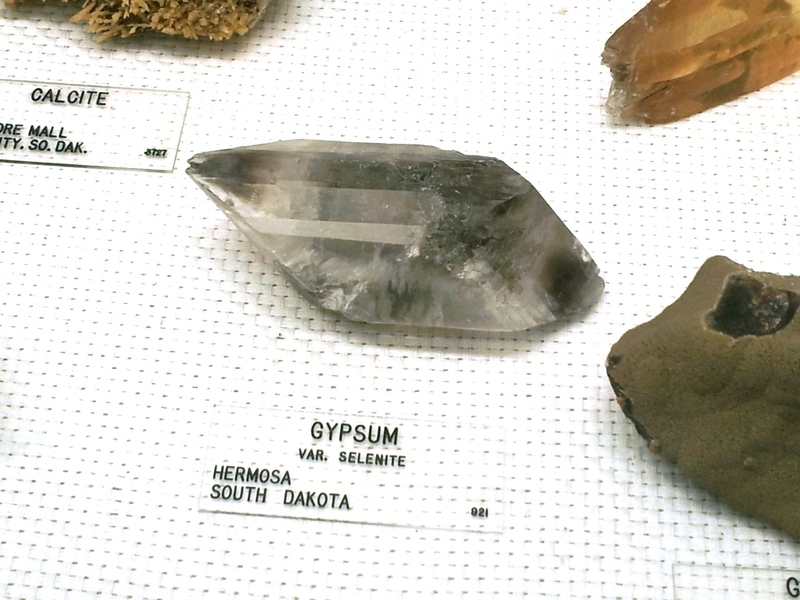 These were also at the Pella booth. These are made with flaky pastry and almond paste – it was delicious. Counteracted all the somewhat fatty savory things I had been eating. Now I want to bake some almondy things. Hmmm, I bet the Iowa State Fair Cookbook has some of them in it. Wade messaged me at one point and told me there was one more section of commercial exhibits under the grandstand that I missed, including more dry soup mixes, so I headed over there, and sampled more soup mixes. Put them on my list to buy later. There was a booth here on my list of food items to try – Gourmet S’Mores, but I was too full of Dutch Letter and bacony things. I decided to start buying a few things that weren’t too heavy, so I started at the State Fair booth and got the Iowa State Fair cookbook (Ok, maybe not so light) and a new Iowa State Fair T-shirt with a corn dog on it, of course. I have one from several years ago that Wade got me that also has a corn dog, a collection of shirts with corn dogs on them is a good thing, of course. I messaged Wade to see what they were up to, and the girls were done volunteering early because they had an excess number of volunteers, so they were going to sit and watch the Bengal tiger show. 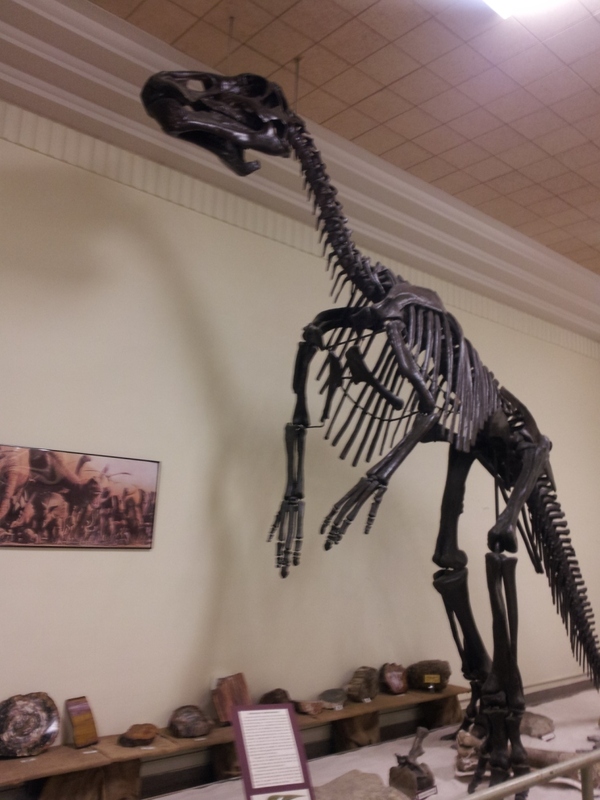 I decided to venture back to the Agriculture building. 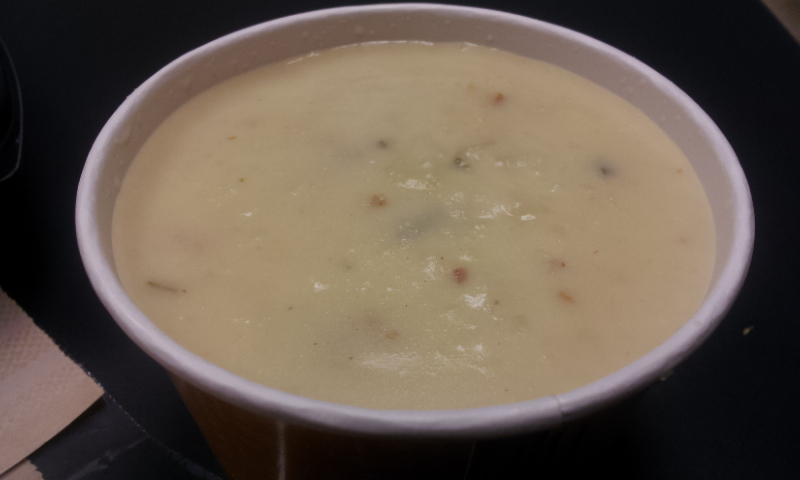 I also made it back over to the Agriculture building because I thought there was another booth there with dry soup mixes (yes, I am quite possibly obsessed). Sampled his soups and bought 4 of them – he had some deal going, 4 for $24 or something like that. I also bought 2 lip balms at the honey producers booth, and promptly left them there, so I am just considering that a donation. 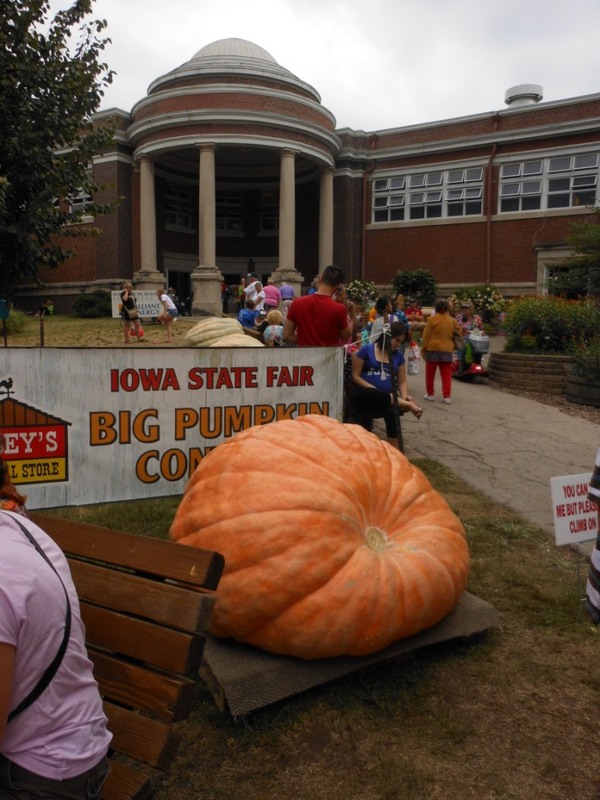 I also visited the giant pumpkins. We had talked about leaving right after the girls got done at Old McDonald’s farm (4:00) but things never work out as planned, and L. had to leave and interview a job candidate, and she and T. wanted to walk through the horse barns together, so we ended up staying a little later than planned. 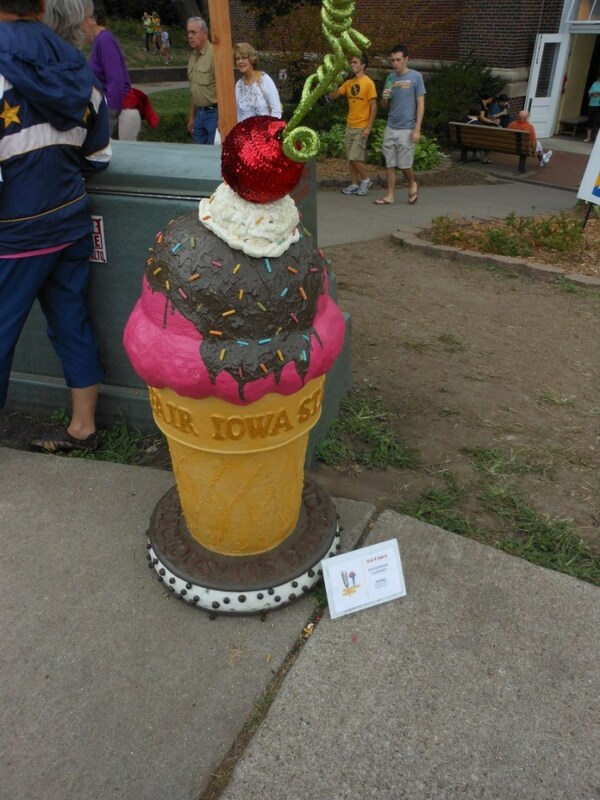 These are a few of the many painted concrete ice cream cones which were displayed around the fairgrounds, decorated by different groups or artists. This one was the cutest one, I think. We also liked the one with the vegetables on top. 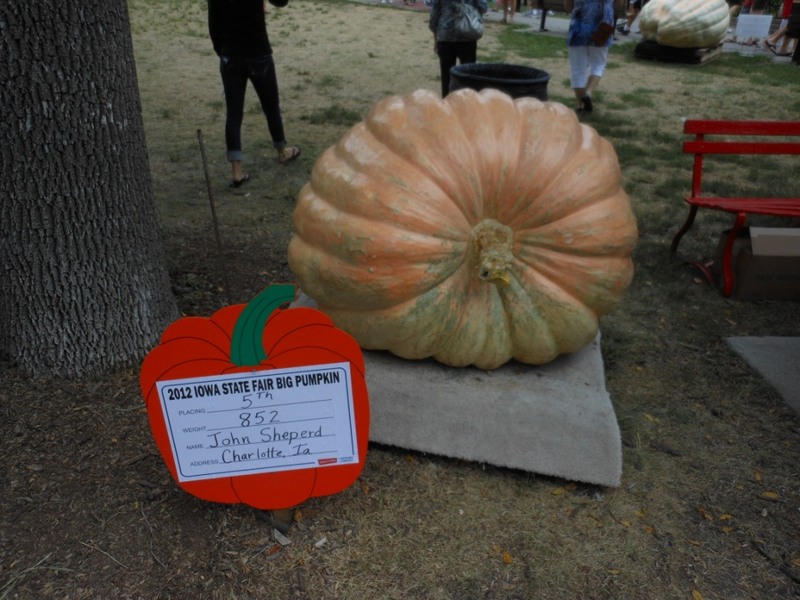 We hadn’t had a chance to look at the giant pumpkins yet, so we did that. 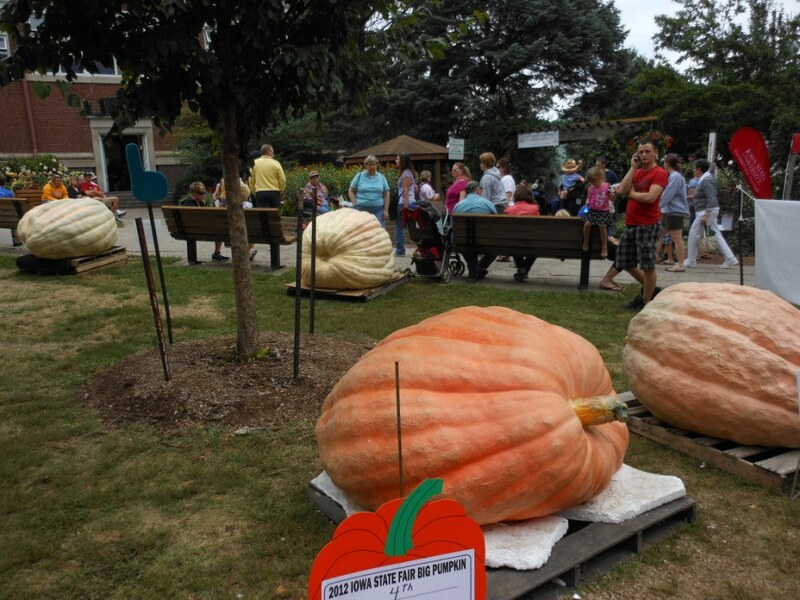 They were smaller than usual this year, because of the drought. We were getting ready to head out, and the kids were given the option to do one more thing before T. would go with her Mom and the rest of us would head home. They wanted to go in the butterfly tent. 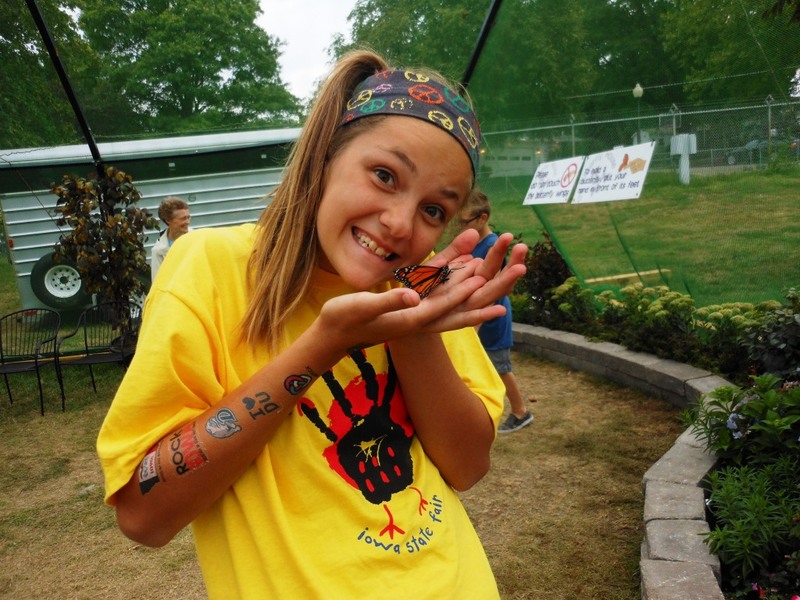 This is an enclosed “butterfly adventure” but really it is a license to manhandle butterflies as much as you could want. The smart and/or lucky butterflies were up high on the tent where no kids could reach them, plus it was starting to really cool off, so they weren’t really flying around much. But there were still enough around for the kids to look at, pick up, fasten to their shirts, feed Gatorade on a q-tip, etc. And there were chairs, so I was in favor of that. I went in with the kids and Wade stayed outside and waited for Laurie to get there. When she arrived, we handed T. off to her and headed home. It rained on us driving home and we wondered if they were getting rain at the fairgrounds. When we got home, S. showed me their garden, which had apparently gone a bit crazy while they were gone on vacation the previous two weeks. Their sunflowers were about 12 feet tall. Their gourd vine was climbing the spruce tree quite enthusiastically. Dawson had wanted me to show me his game (Skylanders?) on the Wii, so he played that for a while as I “watched” and looked at my Iowa State Fair cookbook. Laurie and T. got stuck in the rain at the fairgrounds, and finally bolted through it for the car. When they got home we went to the NYC Pizza Café http://www.nycpizzacafe.com/ for pizza, excellent New York style pizza. And then we were all about ready to crash when we got home. Favorite picture of the day: There are several of these wooden, carved statues around the fairgrounds. It would be fun to mimic them all. 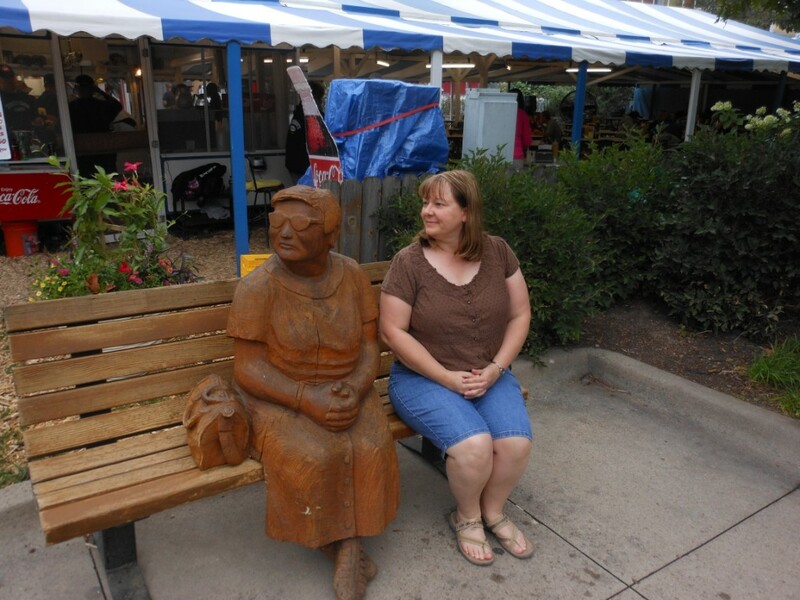 I have a pair of those glasses…..
So….the Iowa State Fair trip. Sorry it has taken so long for me to get these posted, but I was so exhausted every night when I got home from the fair, I didn’t get much done, and after I got home I had to head out on another work trip. Plus, I think you will find these are fairly EXHAUSTIVE, so enjoy! I was flying out of concourse B, but I trekked out to concourse C to Villa Pizza, as I was in the mood for marinara sauce. 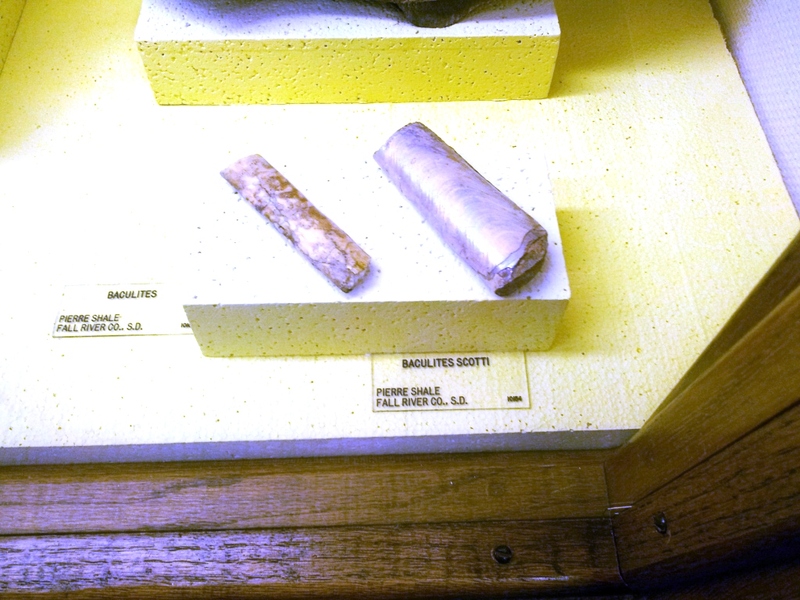 They don’t have a lot of options left for stromboli flavors at that time of night apparently, and the mozzerella/pepperoni stromboli was disappointing – I ended up tearing it apart and mostly eating the interior bits and cheese, dipped in the accompanying sauce. You also get a side dish, and I chose the garlic rolls, because those tend to be good, and they were, especially dipped in the sauce. Plus, they will give you a free refill on your drink. I was on a United flight, and it was full, but I had no problem finding a place for my bag in the bins. I did get whacked by a bottle of water someone put in the overhead which dropped out, I am discovering that is the hazard of sitting in the aisle seat. I have been hit by dropped things and have seen numerous people hit by things that have shifted during the flight. If you are sitting in the aisle seat, beware the danger from above. Landed in Des Moines at 11:45 and my brother was right there to pick me up in front of the airport. When we got to their house, my oldest niece, S. (age 13), was still awake and helped me get arranged for bed. She also opened the door to the part of the basement where Roscoe the dog sleeps in his crate and informed him that I was there, which caused him to growl and bark at me. I hit the hay, and as usual on the first night away from home, had a hard time getting to sleep (maybe partially due to the Diet Pepsi at dinner…) and didn’t sleep particularly well. I woke up about 7:00 their time, and got up and grabbed a Diet Coke and puttered around downstairs for a bit until I heard my brother upstairs. It originally looked like only he and I would be heading to the fair early (grounds open at 8, buildings open at 9) but then he checked with the girls (S. & T. (11)) and they both quickly got ready, leaving nephew D. (7) at home with his mom to sleep in and join us later. I think we left about 8:00 and got to the fair about 8:45, there was a bit of a wait to get turned into the parking lot, that is kind of a traffic bottleneck. Our first stop was the booth for mini cinnamon rolls. 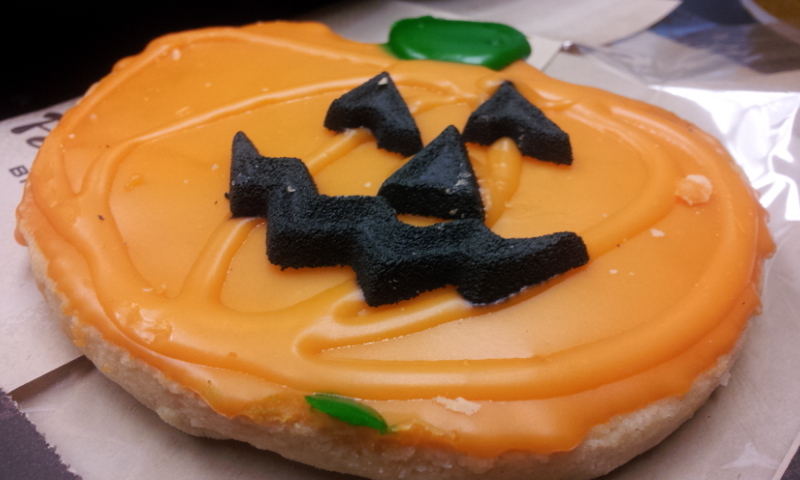 These were OK, especially with the frosting for dipping, but I wasn’t wildly enthusiastic. My brother likes these pretty well. I was more interested in getting to the mini-donut booth. The fair website said this particular booth had a small bag of mini-donuts for $2, well, that was not the case, they were $3, but the machine got jammed while he was working on my bag, so I got about twice as many as I was supposed to, which was OK.
We all participated in eating those, as we walked across the fairgrounds. We headed to the Elwell Family Food Center, I was interested in watching the judging of a contest that involved dishes made with Azteca tortillas. These tortillas contain 50% whole wheat, and some of that wheat is grown in Colorado, so I was familiar with them as a product since we had handed some of them out at some farmer meetings, and I had a chance to sample them, they were excellent. So I got in on the tail end of that judging. I thought they had the recipes online but they only name the winners. The fair does publish a cookbook every two years with the winning recipes, I guess I have to wait for a few years to get those. 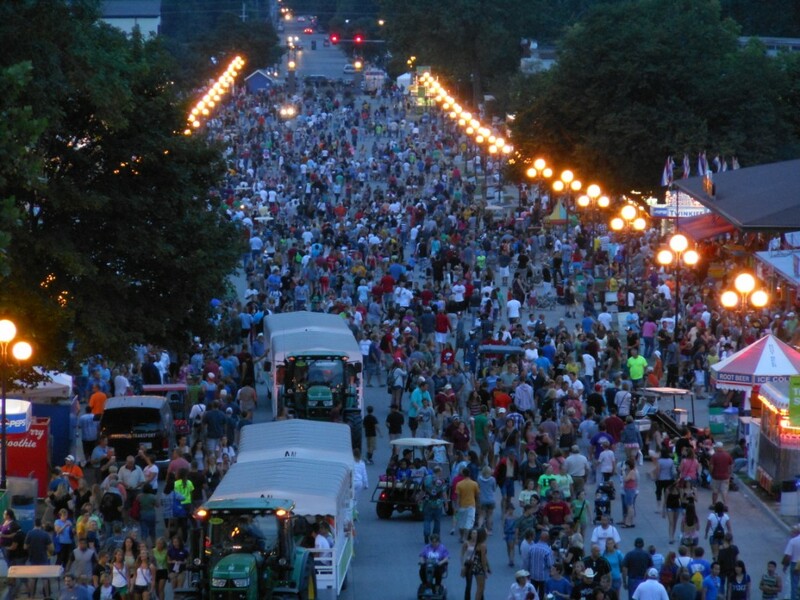 I would love to go stay in Iowa for the entire length of the fair and enter a bunch of cooking contests. 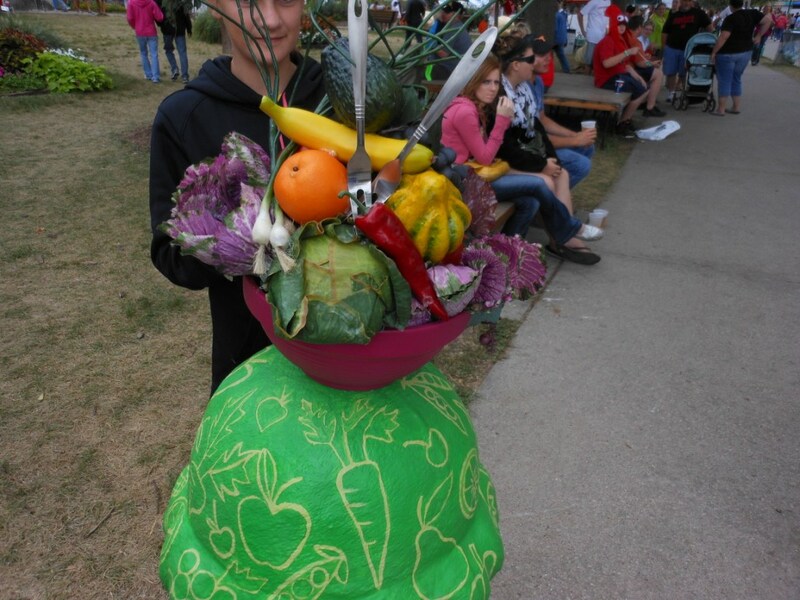 I have entered recipe contests before and going to the fair has me in the mood to do it again. Whenever I do that, my co-workers and Ken’s co-workers are the benficiaries of a lot of tasting samples. 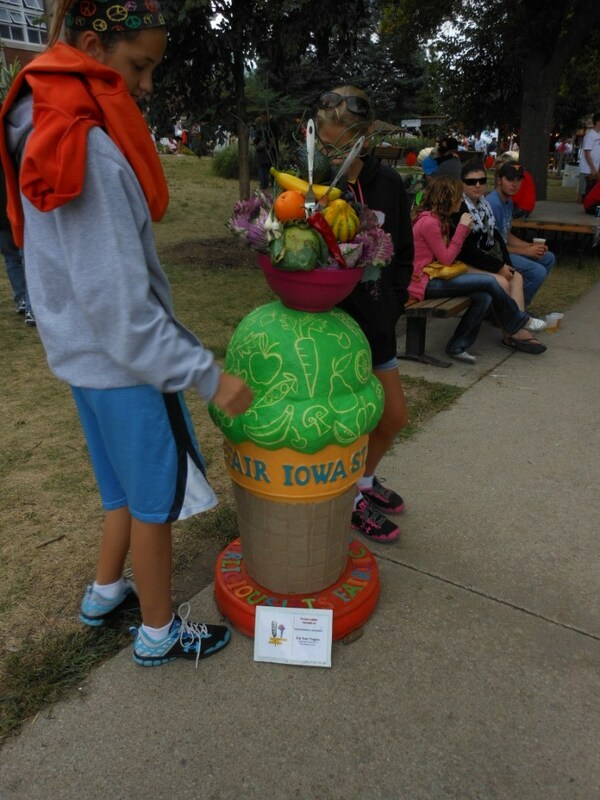 The Iowa state fair has a WIDE variety of different contests. The kids wanted to check out the Chuck E. Cheese “Ugly Cake” contest – things were being held up by the fact that Chuck E. Cheese himself, who was supposed to be a judge, was late. But he did get there by the time we left. I thought to myself, “What poor, hungover teenager is in that costume, looking at gross cakes?” At least they didn’t have to taste them. 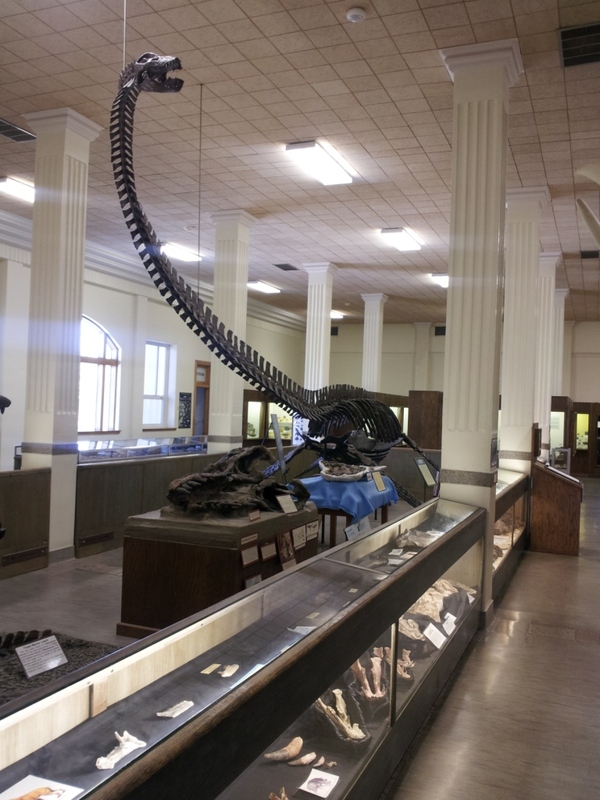 We did wander around that building and look at the exhibits and decorated cakes, and the giant “Chocolate Moose” made of hundreds of pounds of real chocolate. 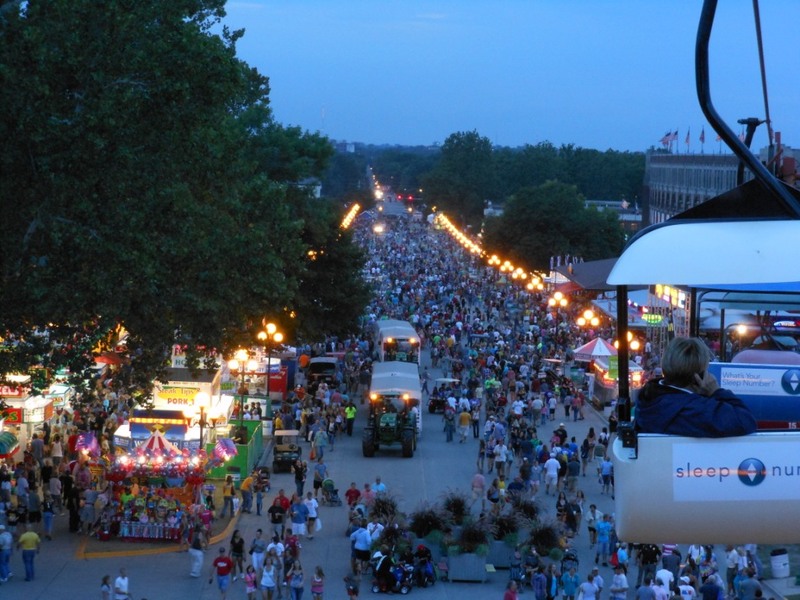 The Iowa State Fair has the largest number of food competitions/entries of any State Fair! Then we headed to the 4-H building. One of S.’s entries from her county fair qualified for the State Fair (a short story she wrote) and so she found that, she got a red ribbon. We looked at many of the exhibits in the 4-H building, with S. and T. sometimes taking pictures of projects for ideas for their own 4-H competitions. At this point I started getting messages from Sis-in-law Kristyn that they were here at the fair, and we were trying to figure out how to meet up. At some point, brother Wade found a refillable soda mug that you could buy for $10, and refill for free at several different branches of the same vendor throughout the fair, so we both took advantage of that opportunity. 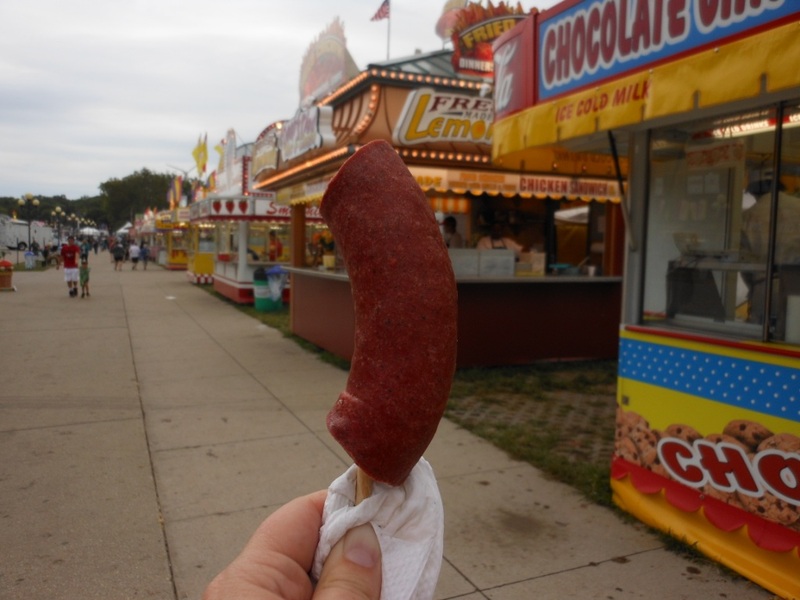 I knew I wanted some lamb sausage on a stick, and since the 4-H building was pretty close to the sheep barns (and that is where the lamb booth is, of course) we headed over there. I think Wade and T. went to find T. a slushy stand, and S. was looking at the sheep, and I went to the Lamb Producers booth and got a sausage on a stick. It was tasty. Then, as we all tried to meet up, we discovered that S. had worked her way to the front of the crowd watching the sheep shearing competition, and she was watching that. She found that very entertaining. “They picked them up, and then they threw them down, and them they sheared them!” I would have found it entertaining too, but it was very crowded and you couldn’t see anything from a distance. 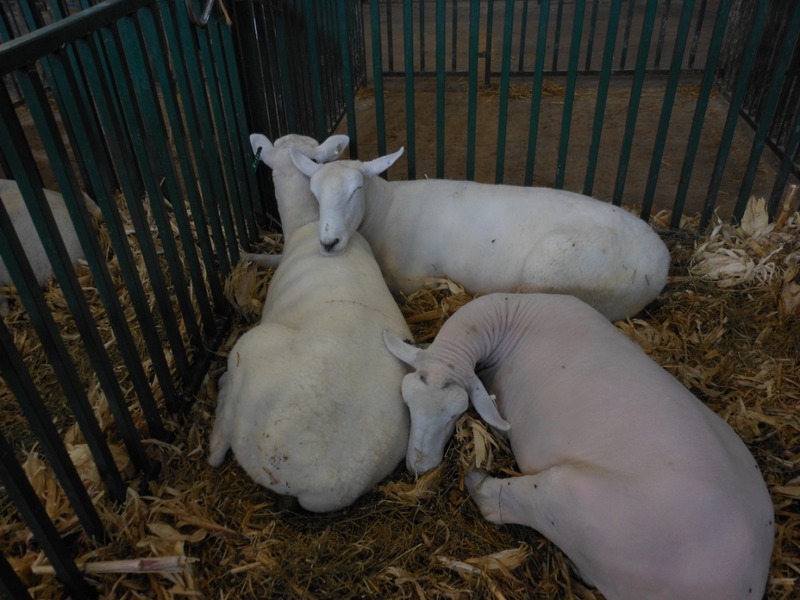 They are serious about their sheep shearing there, and the crowd was abundant and appreciative. I appreciate the sheep barn because of my interest in knitting. I see sweaters on the hoof. We were in the 4-H building for quite a while, and the wandering around the sheep barns took awhile, and it was getting to be about time for lunch (despite the fact that I had just had a sausage on a stick, but that was small….). One of the things on my list to try was the Hot Beef Sundae from the Cattlemen’s booth. 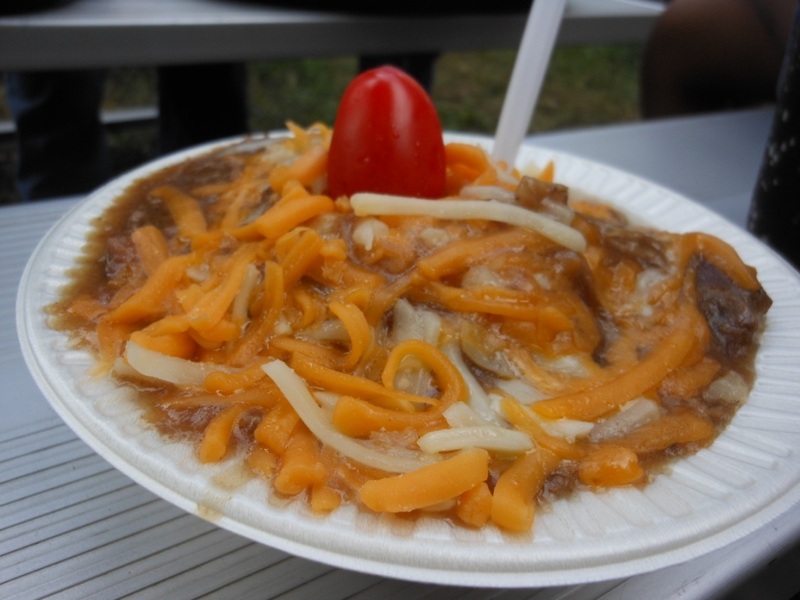 This looks like an ice cream sundae, but is actually mashed potatoes, gravy with beef, shredded cheese sprinkled over the top, and a cherry tomato acting as the cherry. S. and Wade also each had one. We gave these a big thumbs-up. 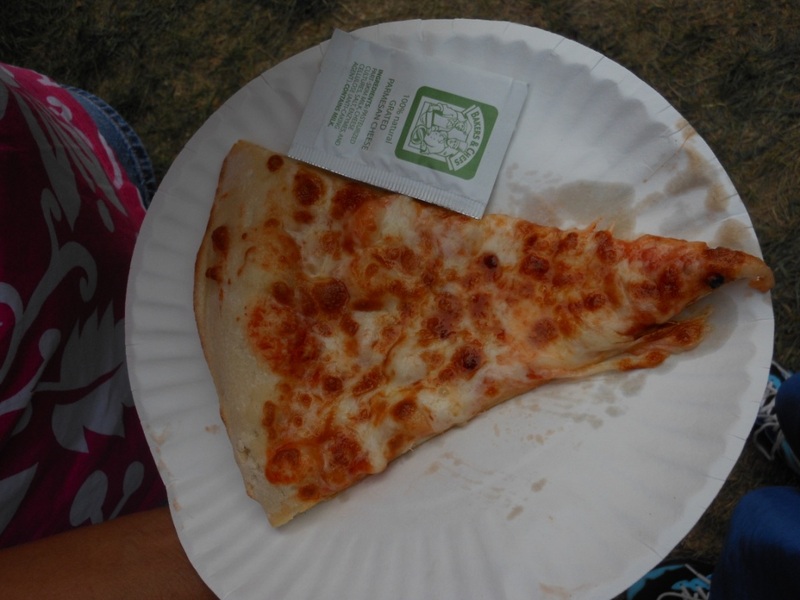 Maybe the best thing I ate at the fair. Brother-in-law John also approved of these. All of this time we were enjoying the great weather. Before we left the house, my brother had vetoed the outfit my oldest niece was wearing with orange short shorts and an orange tank top, telling her it was only 57 degrees outside (he may have vetoed the orange short shorts anyway). 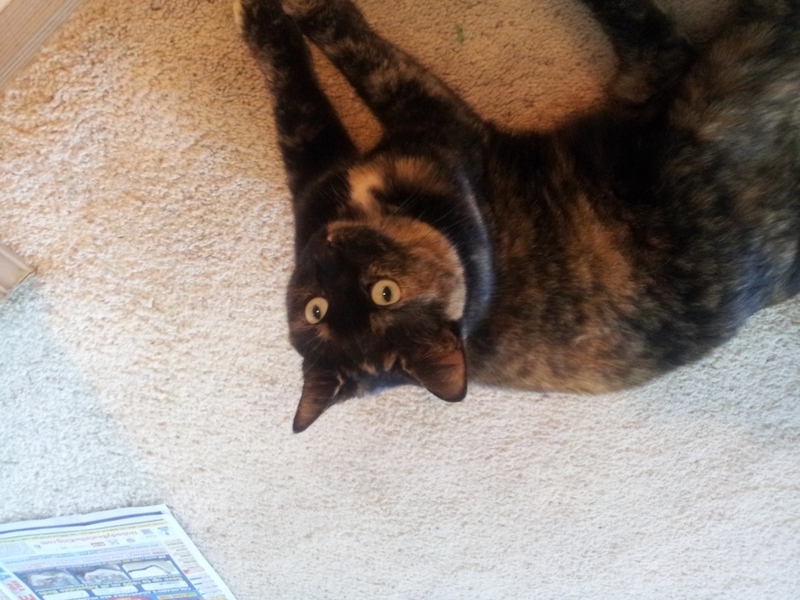 She changed and was glad, because it was only about 80 for a high all day, which was extremely pleasant. We took our sundaes and went to the Anne and Bill Riley stage to sit down and eat. Of course, the daily talent show was going on. The preliminaries to the Riley talent competition http://www.iowastatefair.org/competition/bill-riley-talent-search/ take place earlier in the year, all around the state, and the young people who make it out of the local competitions come to compete at the state fair. This competition is a really big deal here, dating back to 1959. Very neat to see something with such a history and it is obviously a big traditional part of the Fair. There are two divisions, sprouts (ages 2-12) and Seniors (ages 3-21). We got to watch a little of the sprouts level competition – lots of dancers in singles and groups. There was a young piano player named Andrew Lee who was amazing. We are talking future-concert-pianist amazing. His playing ability is way above his age. I could go every day and watch all of these talent competitions. I already checked their Facebook page to see who were the semifinalists out of the show we watched, and will be checking back to see who won. We did hook up with Kristyn and John and family at the talent stage. It was my niece L’s 7th birthday, so it was extra special to see her on that day. Our current youngest niece, A., is 13 months old and is walking (running) very well. She has absolutely no fear and will take off without a backward glance to see if her parents or anybody is paying attention to where she is going. The oldest niece in that family, E (9) was showing her good taste by eating a footlong corn dog for lunch. We were also sending texts to Deanne, Ken’s cousin from Omaha, who was also going to be at the Fair. Of course, my phone was roaming, and doesn’t have the best battery life to begin with, so it had passed away, and I gave Deanne Wade’s phone number, and then also got Kristyn to message Deanne, so we all finally manage to hook up at the Knapp Animal Learning Center. This is a really neat building where they have baby chicks hatching all week long, in addition to cows, sheep, goats, pigs, etc. which also give birth periodically. The kids were all over the place in there, while the adults were trying to get some visiting done. 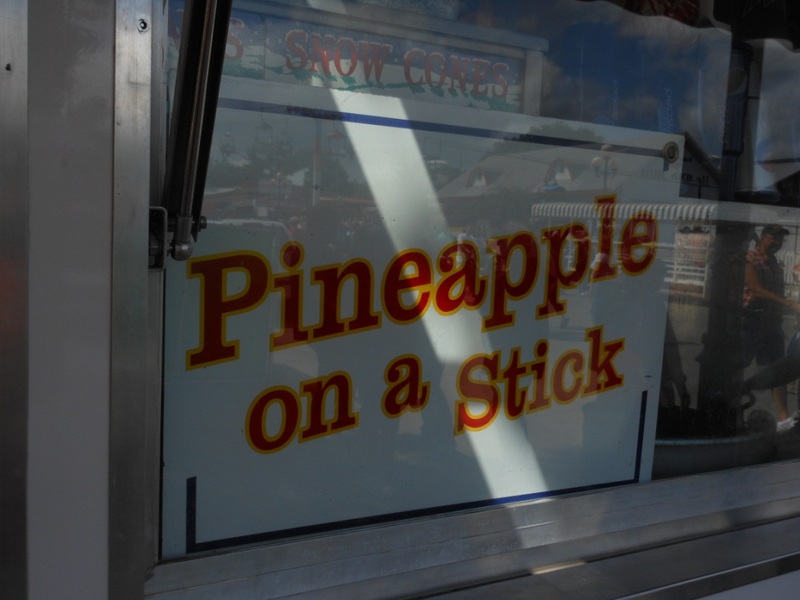 My brother-in-law John had wandered off to get a chocolate dipped canolli (I believe) – he has some of the same interests in the fair food as I do. 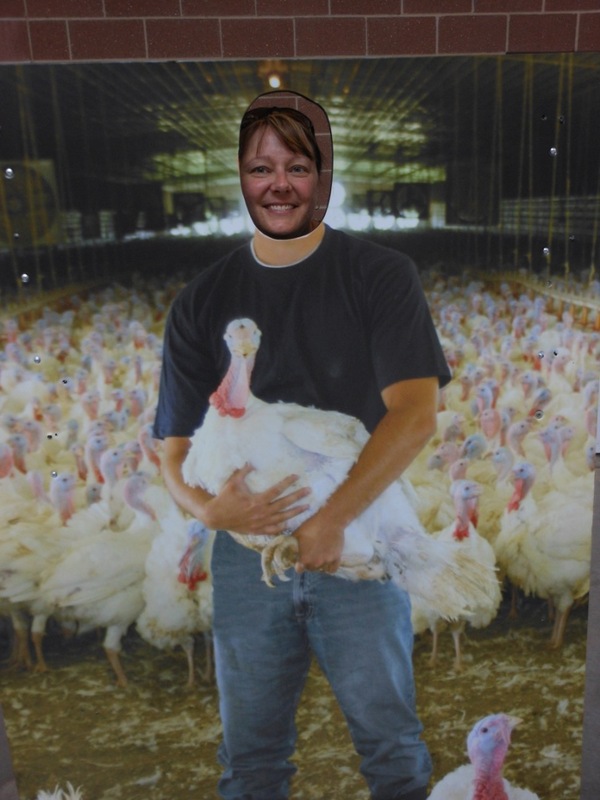 Look, I am a turkey farmer. My sister-in-law Laurie, Wade’s wife, and nephew D. arrived around this time. We spent a little more time in the Animal Learning Center before heading to the Ag Building to see the butter cow. I think about this time someone had to leave to take T. to a birthday party sleep over, so my brother took off with her, leaving Laurie and the kids. We wandered around the Ag Building a bit, S. acting as ringleader for the stair-step assortment of kids. Sis-in-law Kristyn said she would like to hire S. to come with them to the fair the next year. 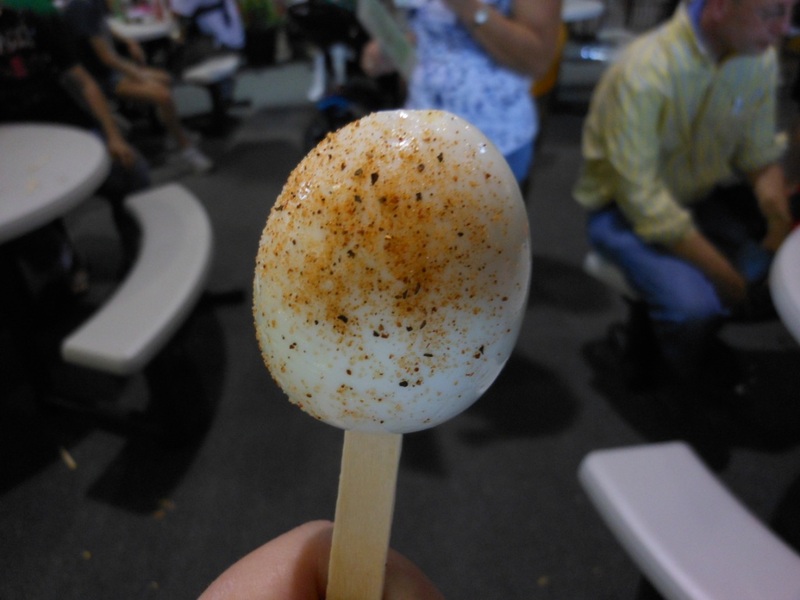 In the ag building, I looked at some of the crops and vegetable exhibits, and had an egg on a stick (free!) 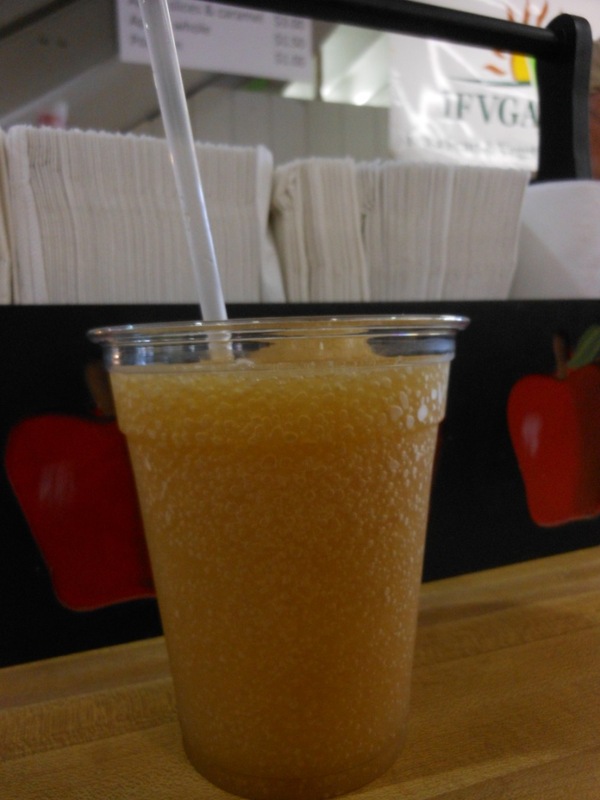 and an apple slush (excellent and refreshing). At some point, John went and stood in a long long to get a double-bacon corn dog. 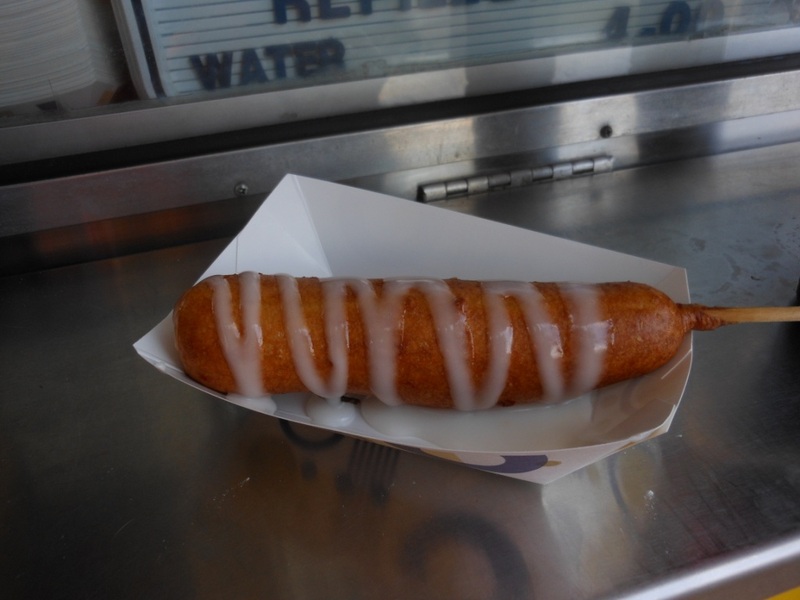 This is a hot dog that is wrapped in bacon and deep fried until the bacon is crisp, and then dipped in corn dog batter with bacon bits in it and deep fried again. I think he liked it but said it got a bit greasy toward the end. And not worth waiting in line for 25 minutes. 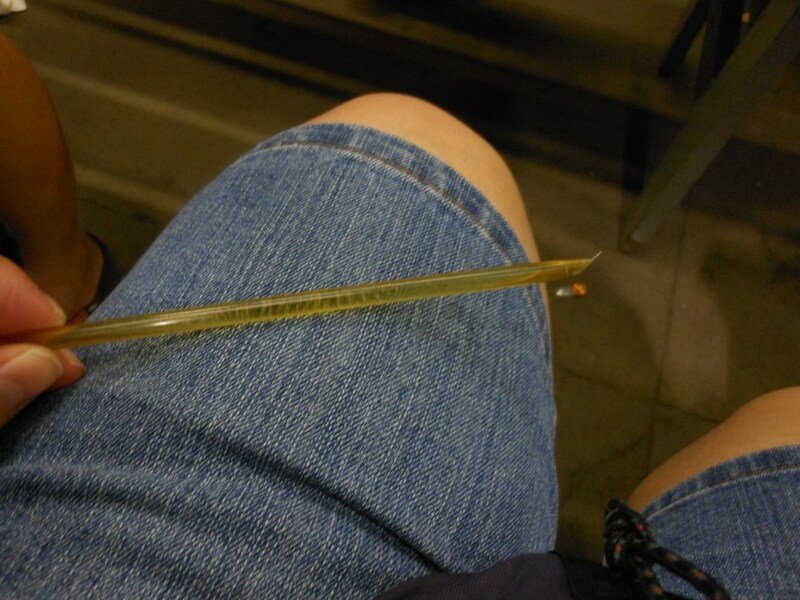 Kristyn shared their Honey Sticks with me. Mmmmm. 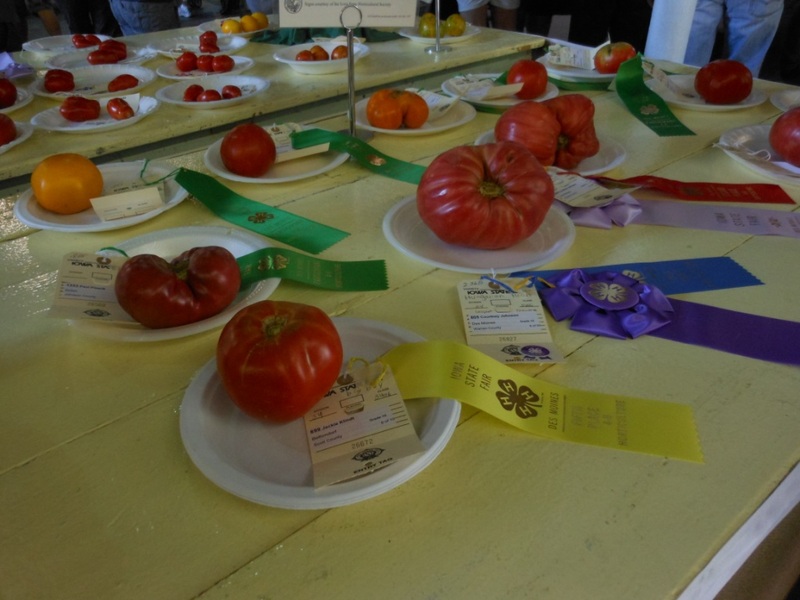 Giant tomato contest. The winner was over 2 pounds. The kids looked at the butter cow and everything they wanted to cover in the Ag building, and then we headed out to the playground behind the Ag Building for the kids to run around. Shortly after we got there, a performance of a speed artist took place on the stage near there, and the kids watched that. I decided I was ready to try some more fried food (working my way through my list) and headed down the hill to the “Triangle’ where quite a few of the food booths were located, and headed for the “Pickle Dawg” booth. 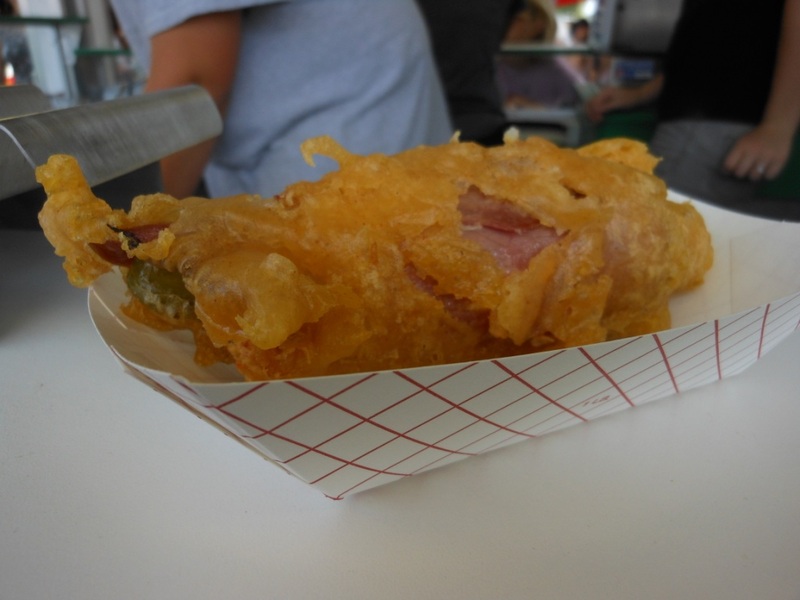 This is a pickle spear, rolled in cream cheese, with some jalapenos (optional) wrapped in in ham or pastrami, and then battered and fried. I, of course, chose the spicy option with jalapenos, and I chose the pastrami. This was excellent, I wished it was a little more fresh, I think it had been under the heat lamp for a few minutes. It was still quite tasty, a good combination of tastes. There were just a few jalapenos, so it wasn’t too spicy. After eating this, though, I decided I didn’t need to eat anything fried for a little while. It was at this point that I realized my quest to try as many foods as possible could be somewhat self-limiting, especially in the fried department. We re-grouped on the hill and headed out together to go see the big bull (data) and the big boar. They were both quite impressive. 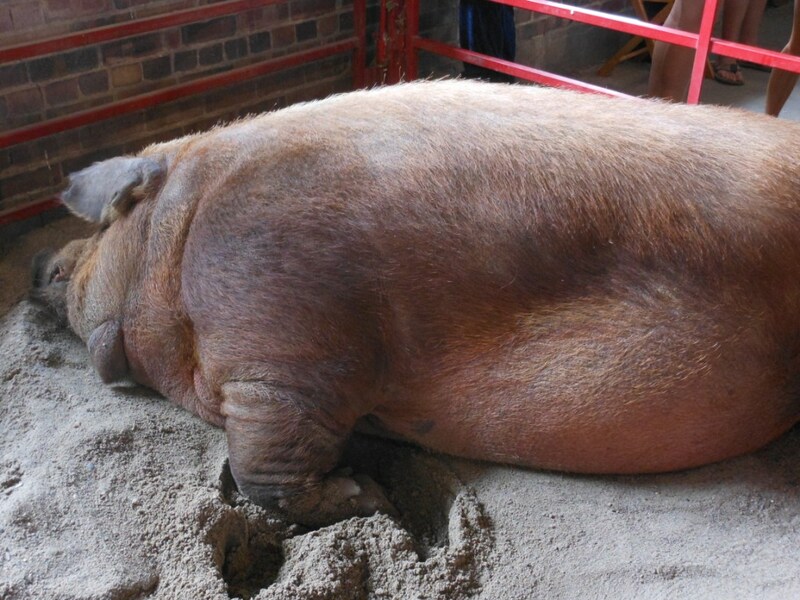 The boar broke the previous weight record. 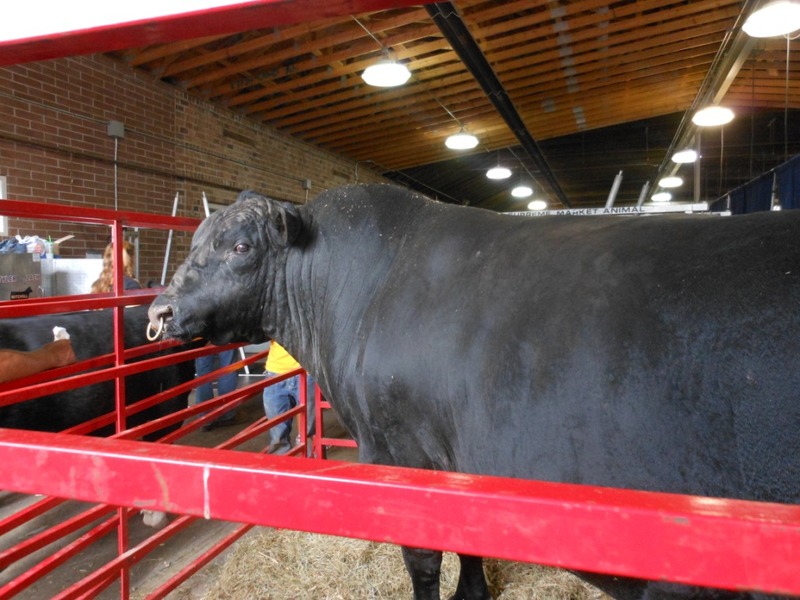 We got stuck in the barn with the big bull because there was a class of show steers coming through that we had to wait for. 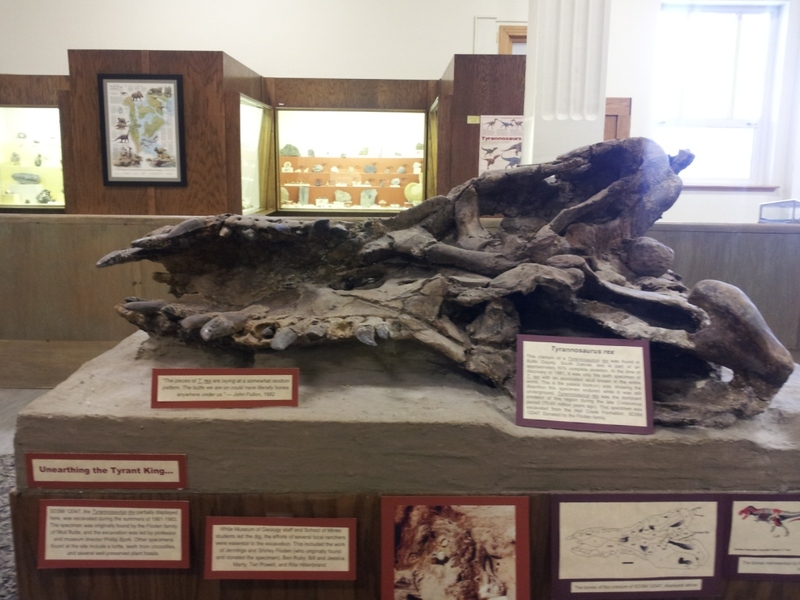 Reggie the boar weighed 1335 pounds. You don’t get to weigh that much by exercising, as he is demonstrating. He probably would like some corn dogs too. Then there was a BMX bike show that we knew D. would enjoy, so the adults sat on the perimeter and the kids pushed their way up into the crowd to watch closer. A. stayed with us and ran around as much as her parents would allow. I was just tickled to sit down, my feet were starting to talk to me about how much I had been walking/standing, especially on cement or asphalt surfaces. We headed back to the food area because D. hadn’t really had lunch yet, and he wanted pizza (not a real adventurous eater yet). So we got him some pizza and managed to get separated from Kristyn and her family, but that was Ok, we each had some different things we wanted to do. 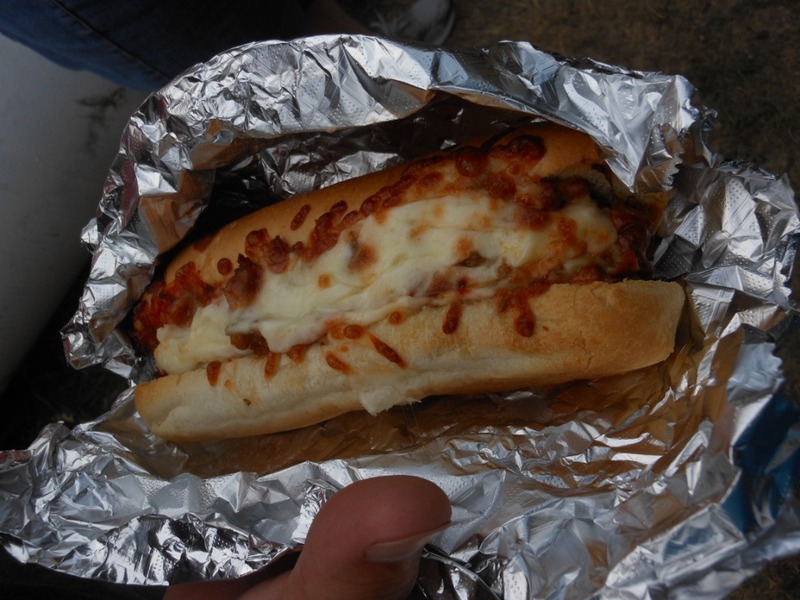 My brother got back to the fair at some point and he and I each tried a different Italian grinder – I tried the Jennie and he tried the Gizmo. I think we both liked them fine, it was just a lot of ground sausage. 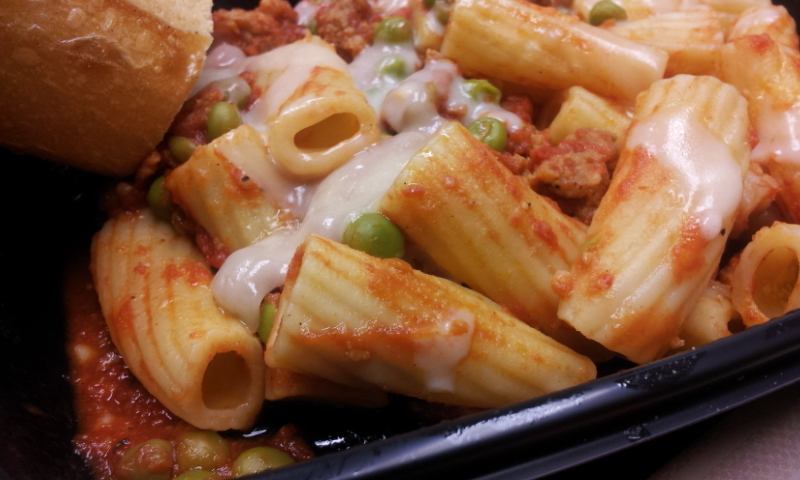 I would have gone for some veggies on them under the cheese. 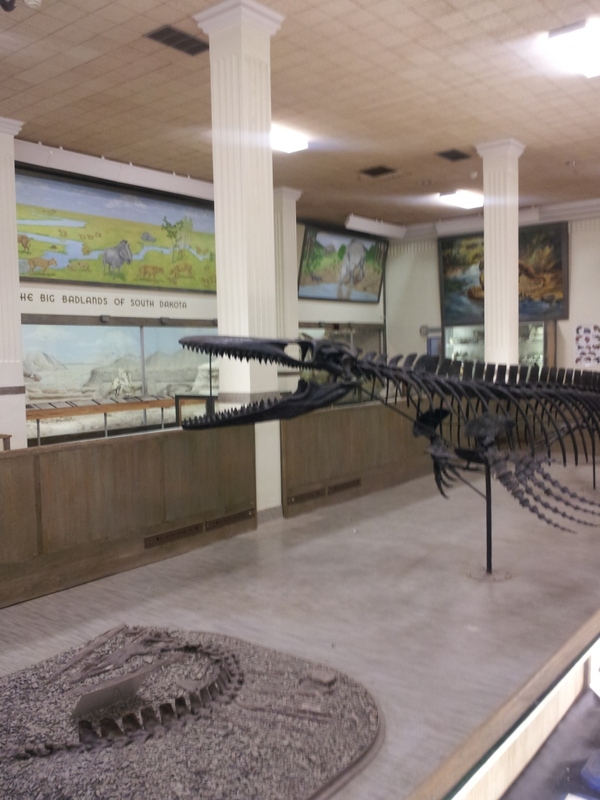 This is the Jennie Grinder. S. wanted to show you how happy I was to have it. This is my brother’s Gizmo Grinder. 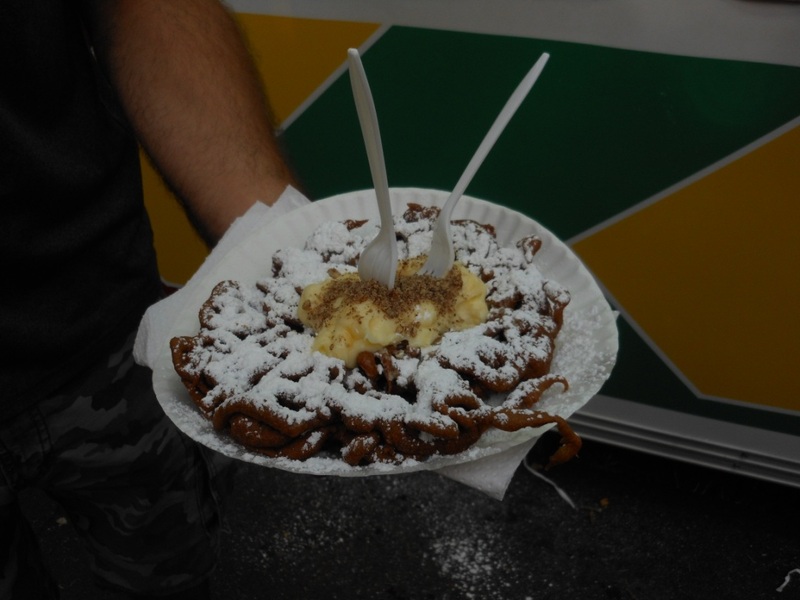 At some point, Wade got the German Chocolate funnel cakes – unfortunately it had also been sitting under the heat lamp for a while, and would have benefited from being more freshly fried. 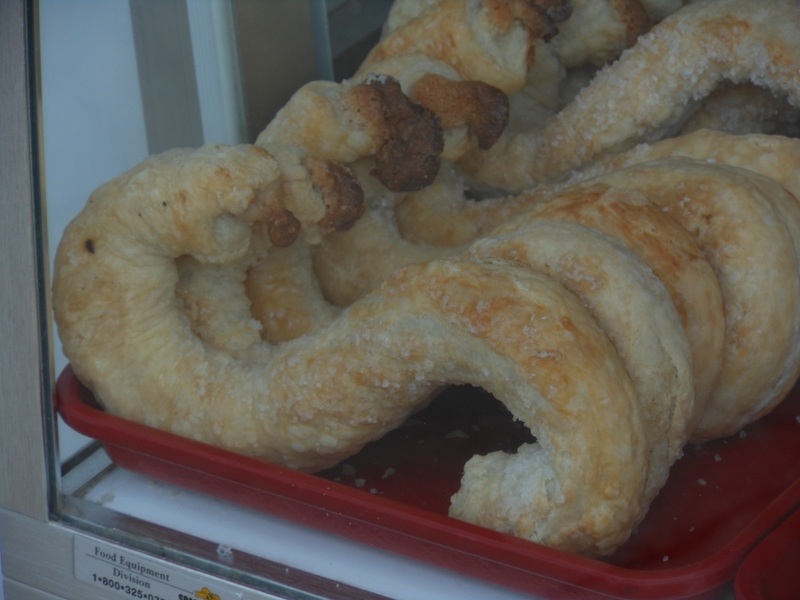 The funnel cakes themselves are chocolate, with coconut flavored cream cheese (?) icing and sprinkled with nuts. There was a concert that night that Laurie wanted to attend, Will Hoge,for free! Plus, there were lovely benches to sit on, so I w as for that. 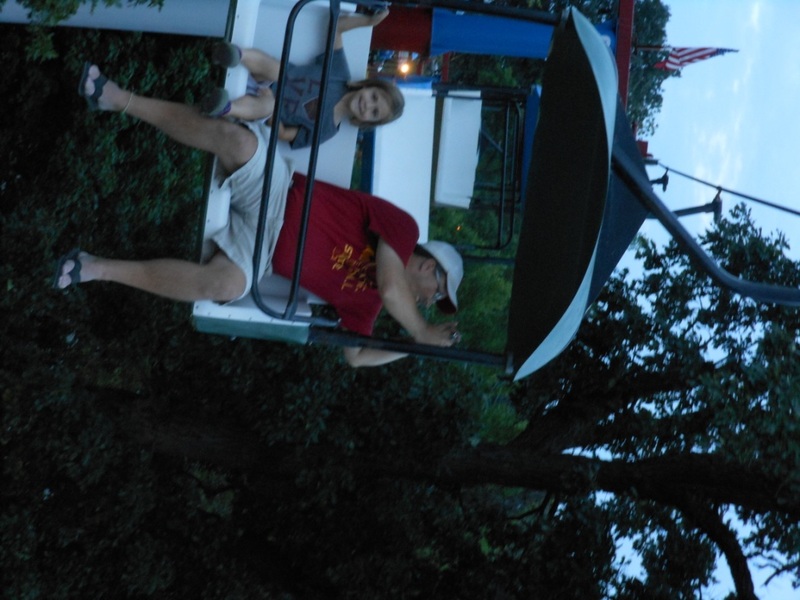 But then I got a text from Kristyn (well, Wade did) saying E. wanted to ride the Sky Glider if someone would ride with her. Well, of course I had never been on it, so I headed over there. Of course, I didn’t realize there were two of them, but they figured out which one I would go to (since I didn’t have a phone that worked anymore, of course) and we went on the tram over the fair. John and L. came along in the car behind us. This tramway is pretty cool, gives you a good view of the fairgrounds. Brother-in-law John taking a picture, cute niece L. Did I manage to get pics of the other nieces? 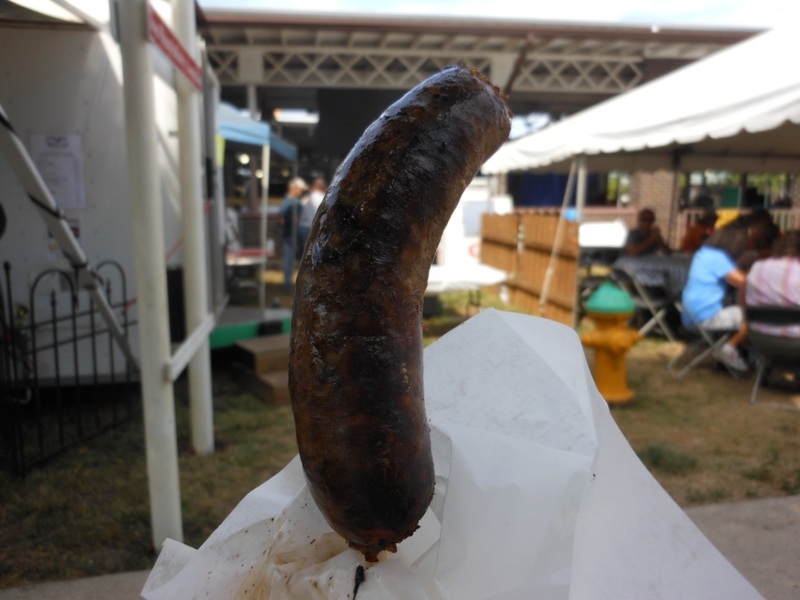 No…..
Grand concourse at the fair. Or Promenade. I don’t recall the official name. I got back for most of the Will Hoge concert – he is quite a good artist, I really enjoyed his songwriting. If you are looking for a new country singer to listen to, I recommend checking him out. If you have a daughter, you should listen to: Baby Girl If you are married, you should listen to: When I get my wings. If you are an aging musician (even the loosest definition), you should listen to: Too Old to Die Young. We finished up watching the concert and headed home, getting home after 10, and being grateful for our beds and rest. I did take the time to post some pictures to Facebook, Instagram having thwarted me, and then my phone having given out. 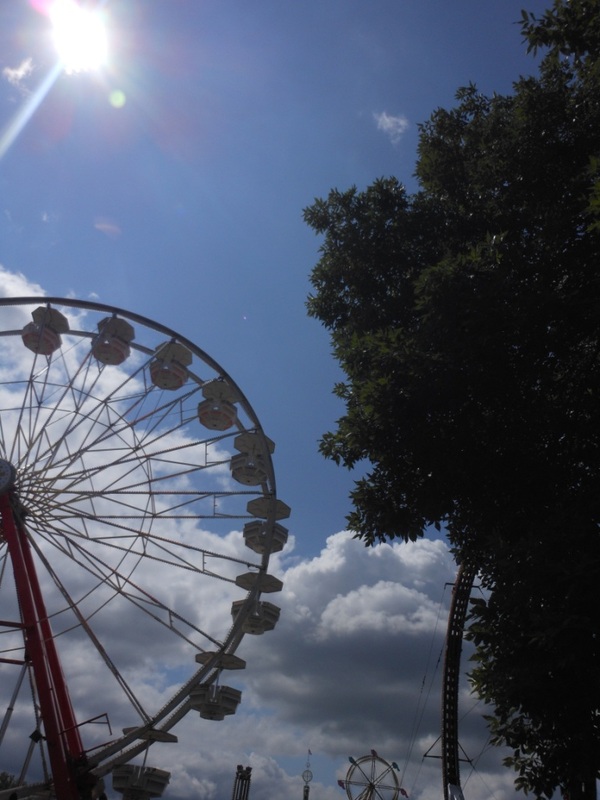 I should have written up this trip report, but that wasn’t going to happen, as tired as I was……The Iowa State Fairgrounds are really laid out well and are quite compact, but you can still spend a lot of time and cover a lot of distance walking. Well, to give you some relief from the food pictures this week, and the food pictures yet to come…. 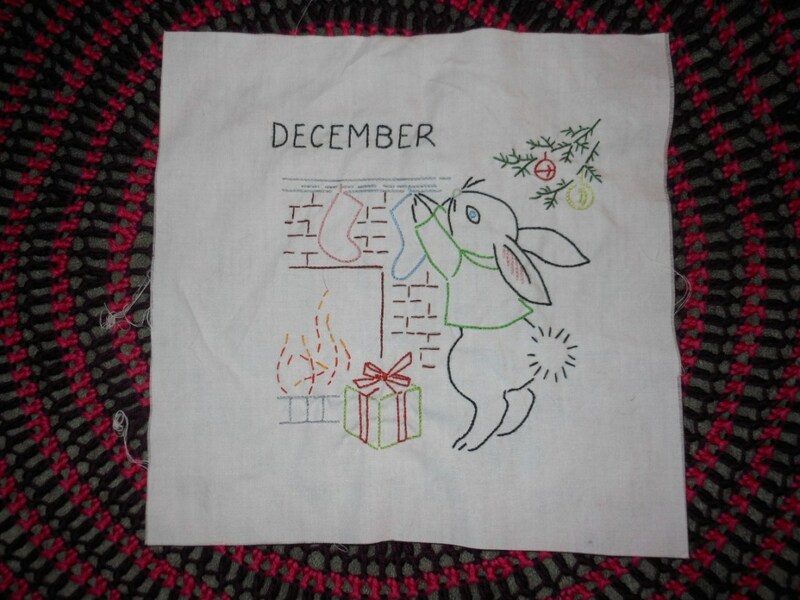 The last block of the bunny quilt. Now to get it assembled and quilted, hopefully by niece’s birthday in October. 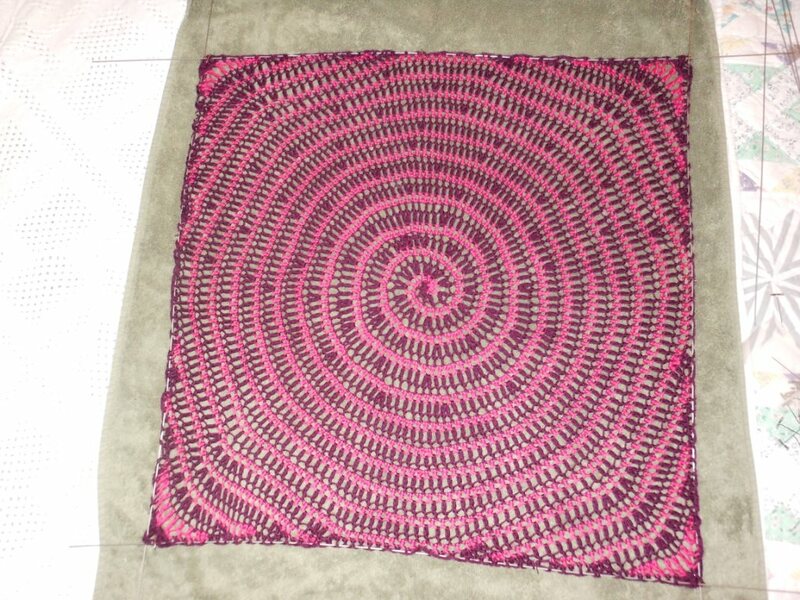 The first block of the Vortex Afghan. This is supposed to measure 17 inches, and mine measures 24 inches. Apparently I should be using a smaller hook. Oh well, not turning back now. 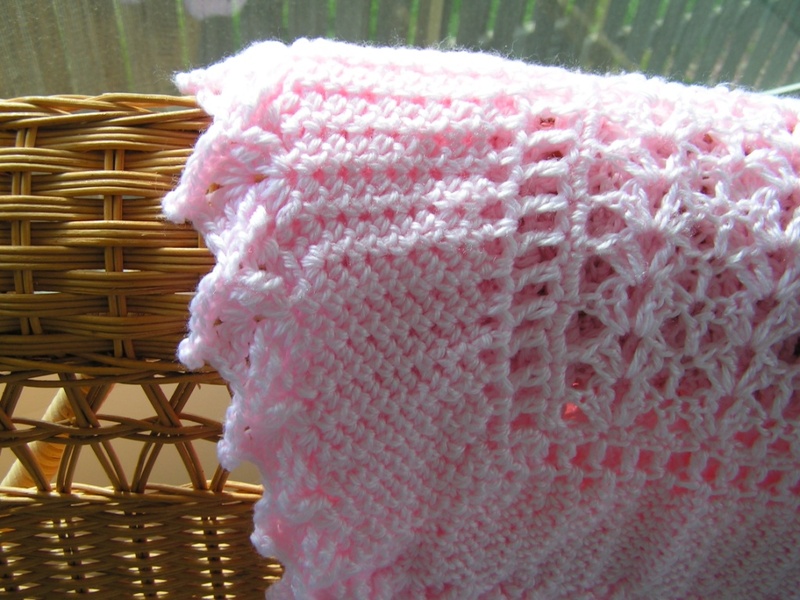 This might be a 4-block baby blanket, not a 6 block one. These colors also look pretty scary in this picture, they are not that bad, really. 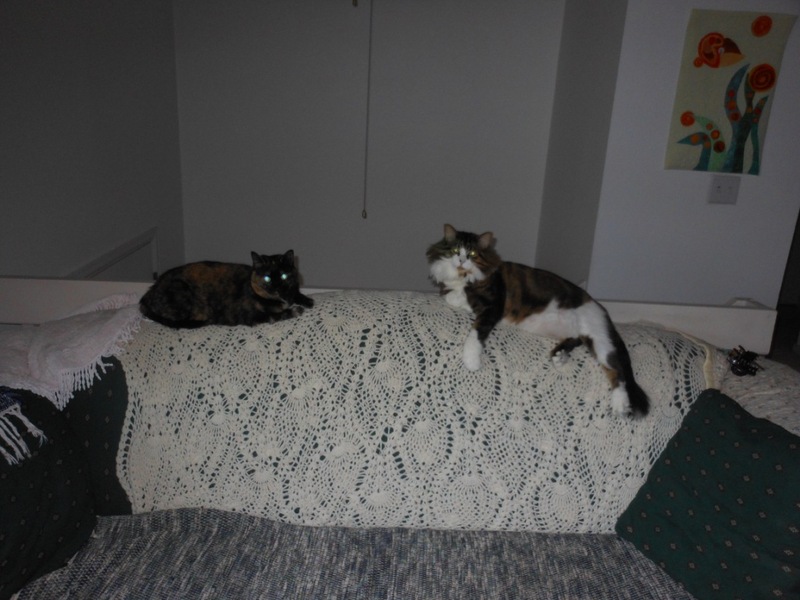 And two lazy cats, sleeping on the afghan, when I have perfectly lovely rugs/blankets/etc. on the arms of the couch for them. Yes, they do apparently know they look picturesque. 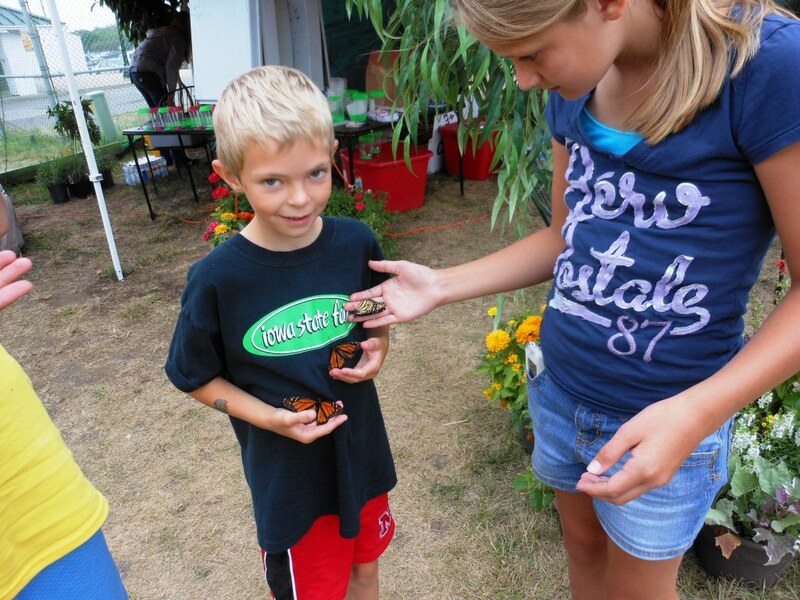 This is my list of things I am interested in, for the IA State Fair. I am not saying I am going to eat all of these things, I am saying I am interested in them…. Things have still been kind of crazy with work (I was dreaming about BROCHURES all of Friday night/Saturday morning, does that give you any indication?) and Ken is crazy busy with his new movie project, so I apologize that the blogging has been scarce. 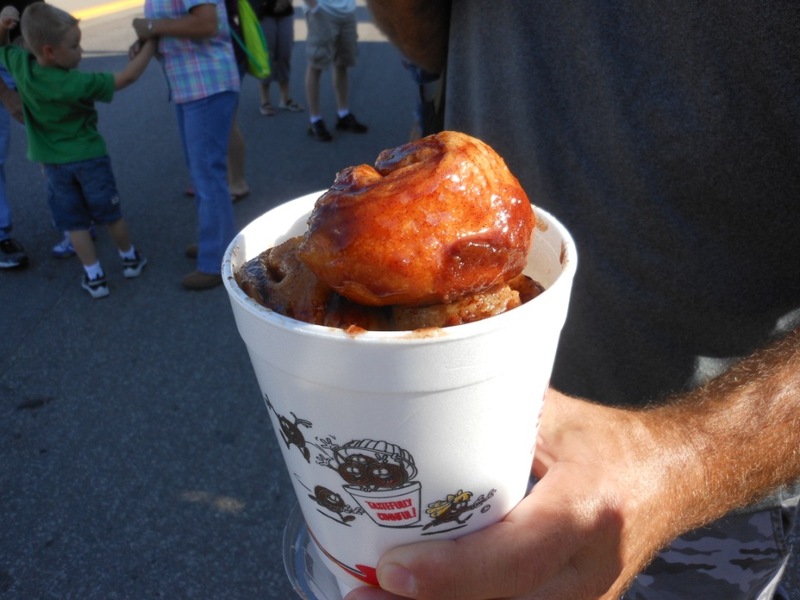 I am trying to get warmed up again for the great Iowa State Fair trip, which will involve MANY, MANY food pictures. Greatly looking forward to that. My food list is LONG, LONG, LONG, probably many more things than I can try in three days. 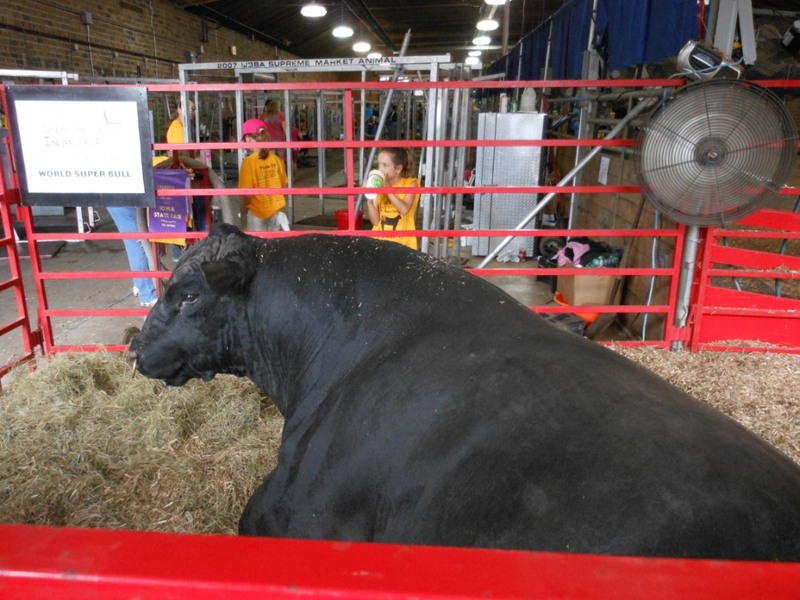 Why the Iowa State Fair? Well, it is one of the top three state fairs as far as I am concerned. Only Texas and Minnesota have bigger attendance (there are some local fairs in California and TX that also have bigger attendance, but I am talking about STATE FAIRS.) And they are quite famous for their food on a stick. And I will get to see two sets of nieces/nephews. 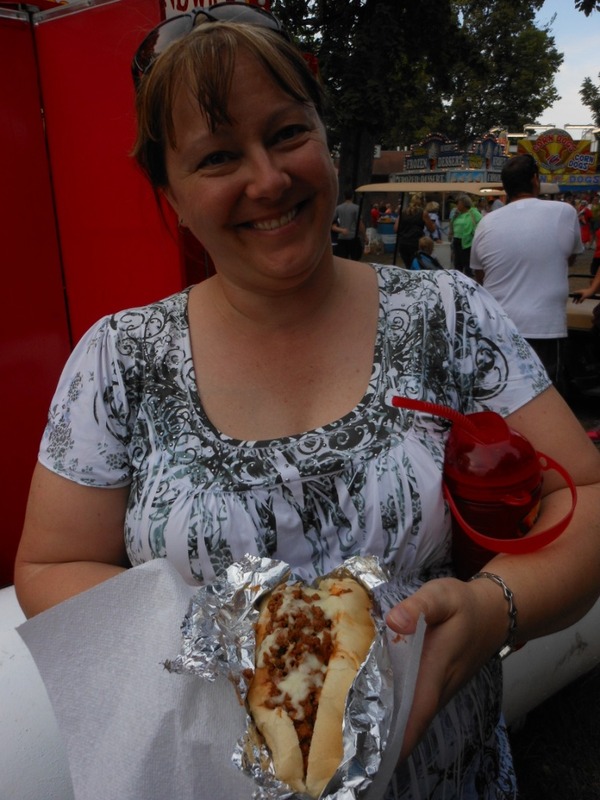 Well, I am not at the fair yet, so here are some things I have been eating lately…. 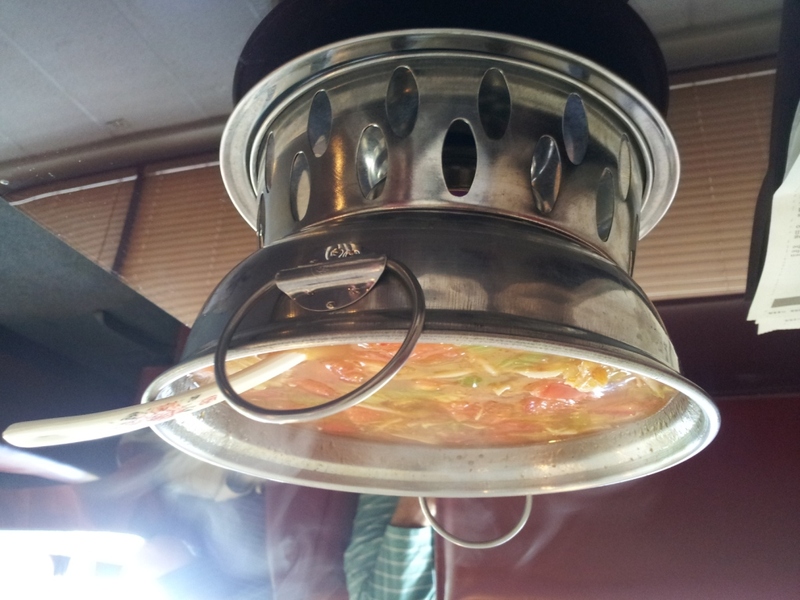 This is the pot it comes in, with a little buffet heater under it. It does keep it warm. 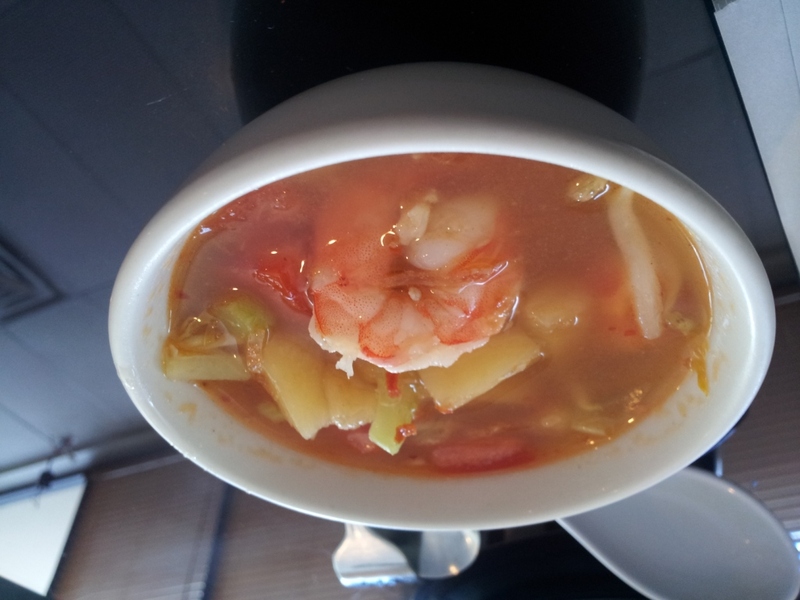 It had pineapple, shrimp, bean sprouts, and other vegetables. Not bad, but I don’t know if I prefer it over their pho. 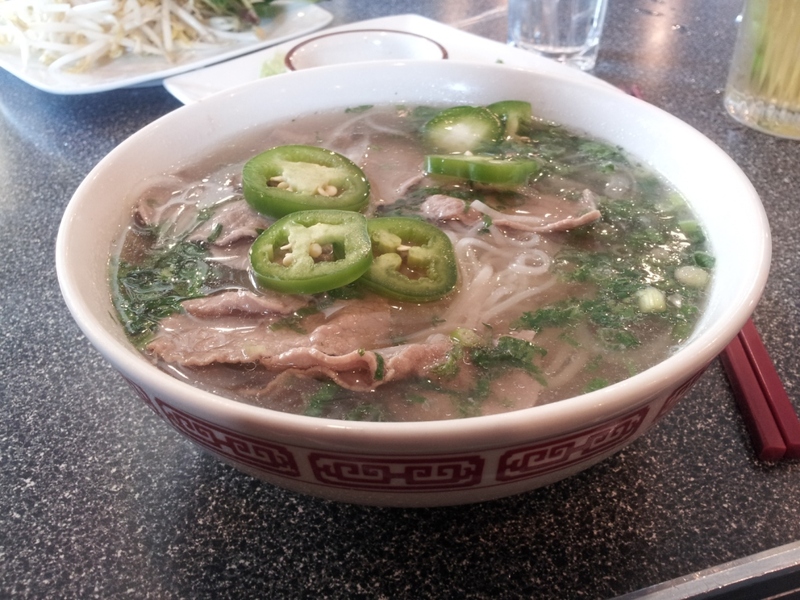 I do prefer their pho over the other major pho place in Fort Collins, Pho Duy. 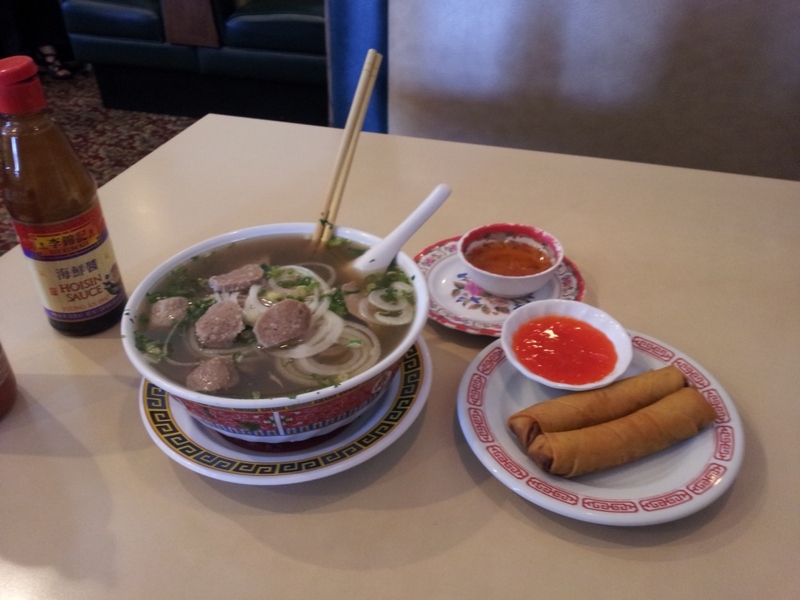 Plus Pho Duy has rather odd background music, a rather short loop of Muzak-arranged hymns. I am not sure what to think of it. It does not enhance the pho experience for me. I have nothing against the easy-listening version of Amazing Grace but I do not want to hear it twice in the course of one meal. 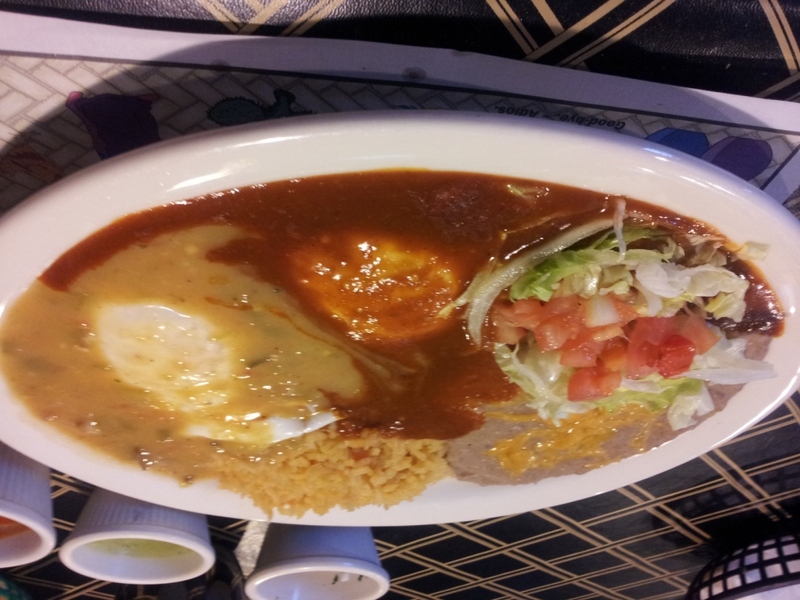 Huevos Divorciados are eggs smothered in one half green chile and one half red chile. They were good, but I think I have come to the conclusion that I don’t like anything else on top of my eggs. Or I don’t like it very often. I would have this again, just not every week. Their refried beans are excellent. I am pretty sure they contain either butter or lard. Or both. Tacos Y Jalisco also has some of the best salsa in Denver. It definitely has the best salsa assortment. 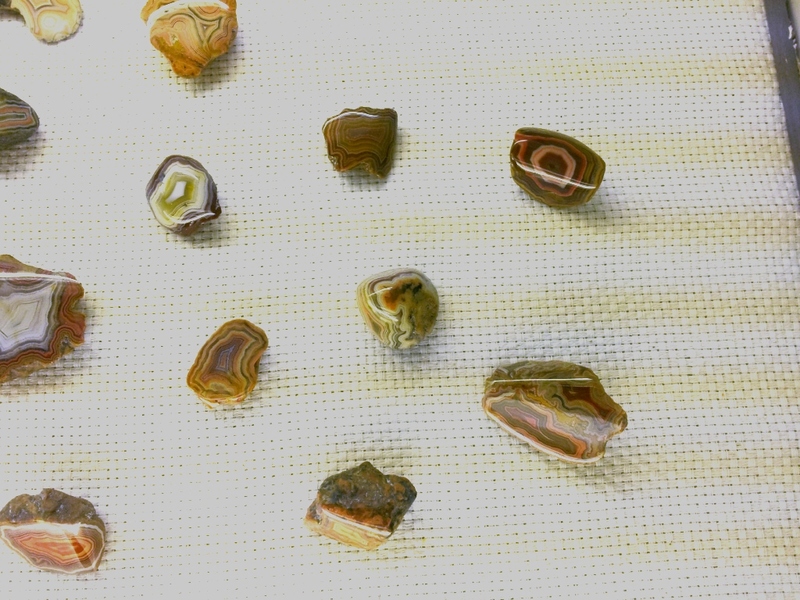 You get four different kinds. 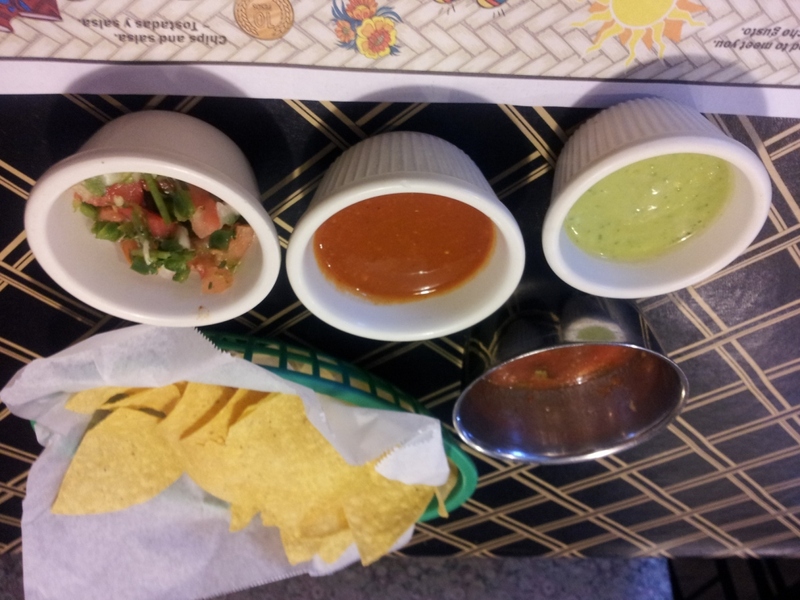 Here is how someone else on Yelp described them: “a verde, pico, and two red sauces — one hot, the other hotter.” The verde is different in that it has avocado in it. I love them all, of course. My least favorite is the middle red one. I think it had chipotle in it, which I do not really care for (of all the things for me not to like, I know, I know.) They apparently have posole and I need to remember to have that sometime. I had eaten here before but I don’t remember what I had, so this was kind of a re-discovery. Mmmmm, I will be back. Golden Bowl Noodle House in Broomfield. This is an area that has at least 4 Pho restaurants in a two block radius. I have tried them all, and this is my new spot. 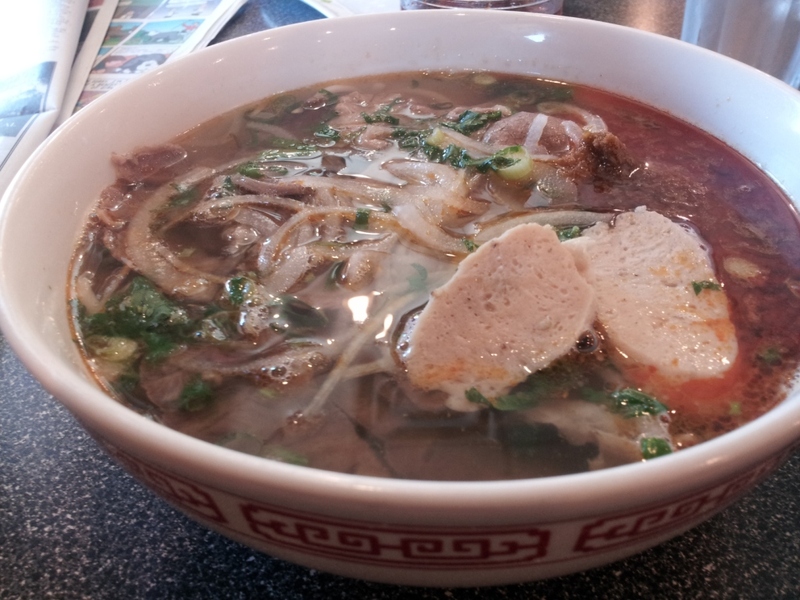 I didn’t even have the Pho, I had something called (I think) Spicy Beef Soup – loved the broth. The beef could have been better, but really, I am all about the broth. 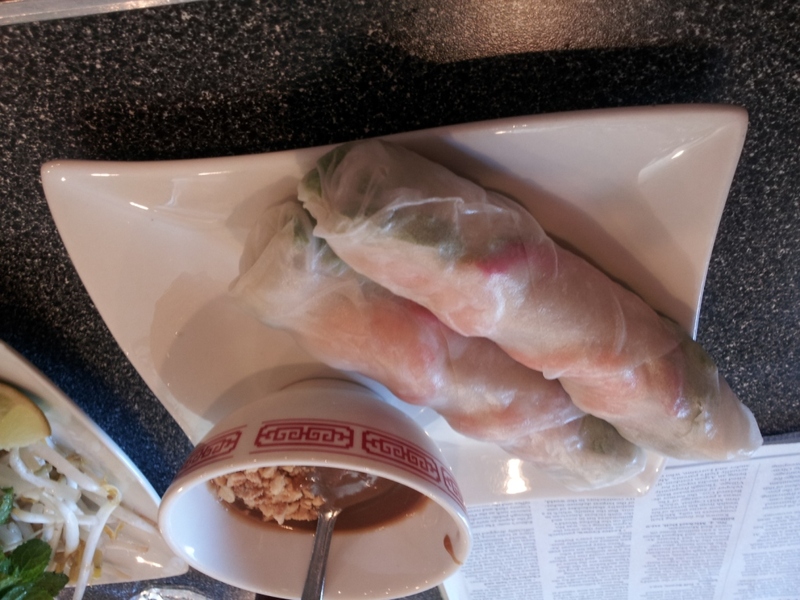 And their spring rolls are good and are the cheapest I have found recently. 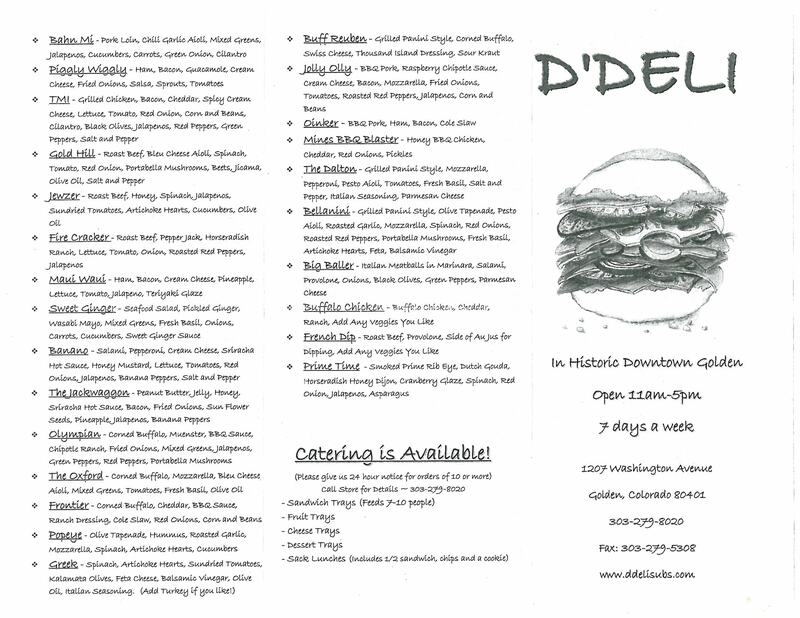 I picked up a copy of their take-out menu and will be posting that as soon as I can find it again….. I have no idea what those two chunks of pale stuff were, but they were delicious. Maybe friend EM knows??? MMMMMMMM. It was nicely spicy, too. Next time I will ask for additional fire oil. They had chili paste but I don’t care for the chili seed texture. 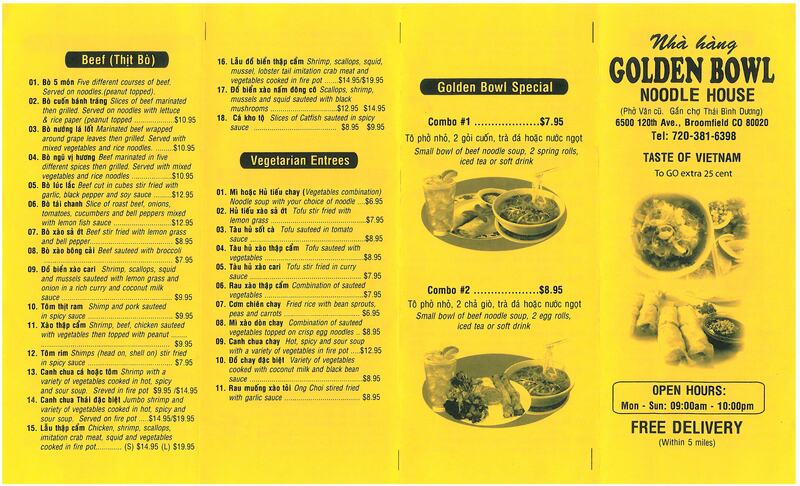 Golden Bowl ALSO had cheesy Muzak, it was a mix of the best of the 80s, Beatles, and Andrew Lloyd Webber musicals. Interesting. And finally, dessert! I had a rough week, needed some cupcakes from Butter Cream Cupcakery. 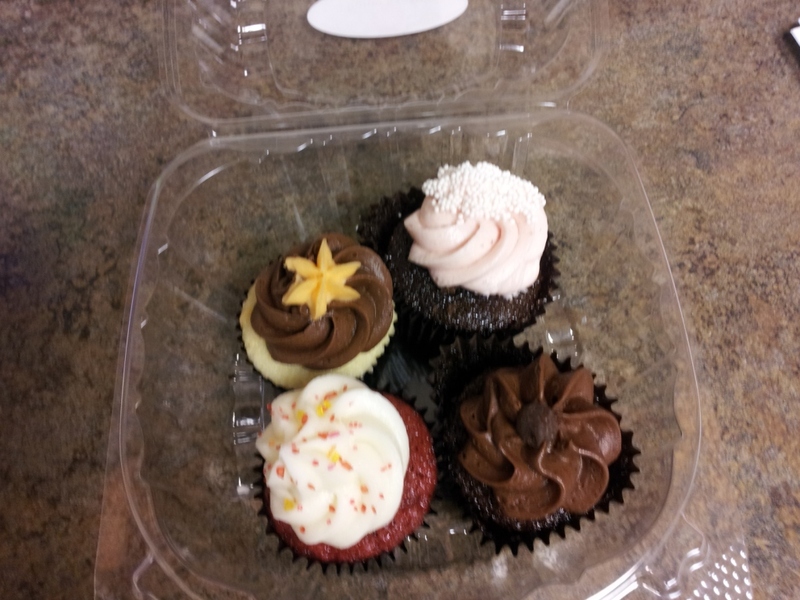 Pictured are (clockwise from top left) orange truffle, neopolitan, chocolate, and red velvet. Yes, delicious. They have the chocolate and red velvet every day, neopolitan and orange truffle were special flavors for that day. Yes, they did improve my afternoon.